Well it has been such a long time since I have posted anything. I have been so busy living life that there is not much time for me to sit down and write. Which I am truly loving. Note: There are going to be a lot of pictures but there is no way I couldn’t. With all that said I wanted to share something very special that I was able to do. 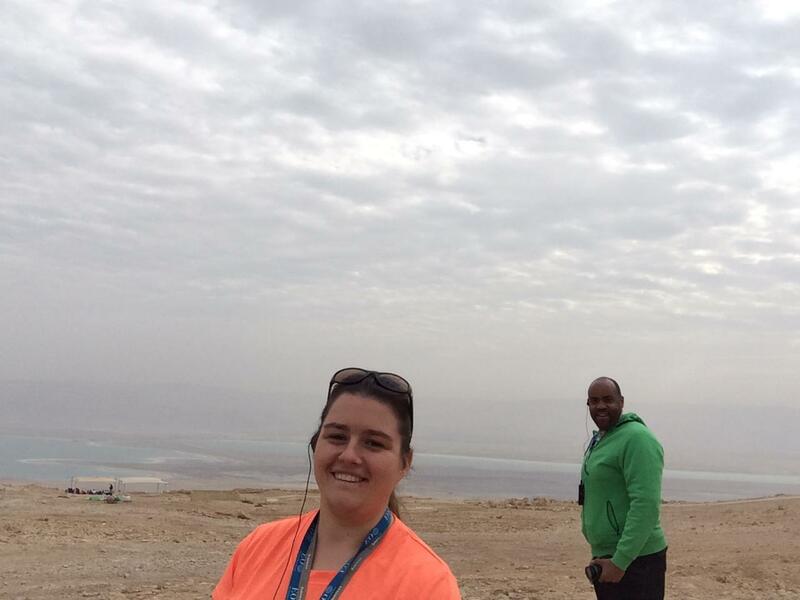 I was able to travel to Israel and visit the Holy Land. As I am Catholic this was a big deal for me. I was headed to the land of Jesus. I was traveling to all the places I had learned, taught and heard about. 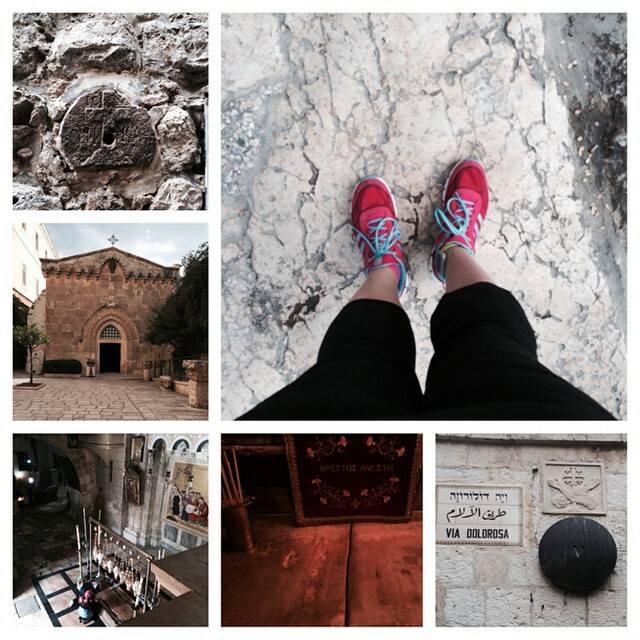 I was going to be walking where Jesus walked and lived. How cool is that. The trip started January 20, with departure from my home city to New York City. Everything went great at my home airport. No problems with my hip or Bioness. Great feeling, I always wonder if my hip is going to set anything off. Well got to NYC and in line for our next airline. Lets just say getting to the counter was an experience. We were separated from our tour host who flew on a different airline which our tour company made a bad choice of doing. 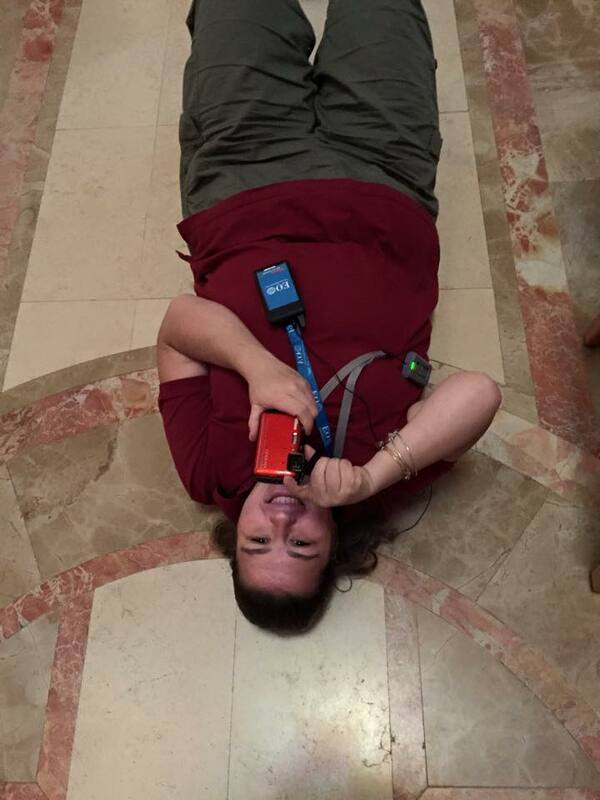 So the people were very confused why we didn’t have a host with us. After being questioned even before reaching the counter our group was finally allowed to go to the counter. At the counter I was questioned for 20 plus minutes. They thought that my passport was fake because it was brand new and never used. This was my first time traveling over seas. After all the questioning I was finally allowed to be escorted through security and told to arrive at the gate an hour early before boarding the plane. I went through security with no problems. I did as I was told and got to the gate early and my bags were taken from me and searched. After 30-45 minutes they next asked me to enter the room where my bags were and proceeded to check me for a bomb, wiped my shoes, Bioness and hands down. Finally all clear and escorted to the plane. I figured something out after the questioning at the counter. They thought that I was going to join ISIS. They kept asking if I was going to Syria, if I knew anyone there and so on. They didn’t get how I could be leaving school if I was a teacher or how I could afford the trip. Well they got that one very wrong. You couldn’t have picked a more innocent person. But I understand that they were just trying to protect other people and their country. Finally on the plane and ready for the 11 hour flight. I did pretty well, I was able to sleep for a little bit on and off. My travel buddy wasn’t able too, I felt bad for her. 11 hours sitting 3 years ago would have been a total night mare. Not that I sat the whole way there, did some walking around. My hip did great, it became a little sore towards the end. My left knee did pretty good too, it did become sore but seemed to work itself out after a while. Finally in Tel Ava and very happy to be off the plane. It was January 21 about 5pm at night. Just enough time to meet some new people have dinner and get ready for the next day. 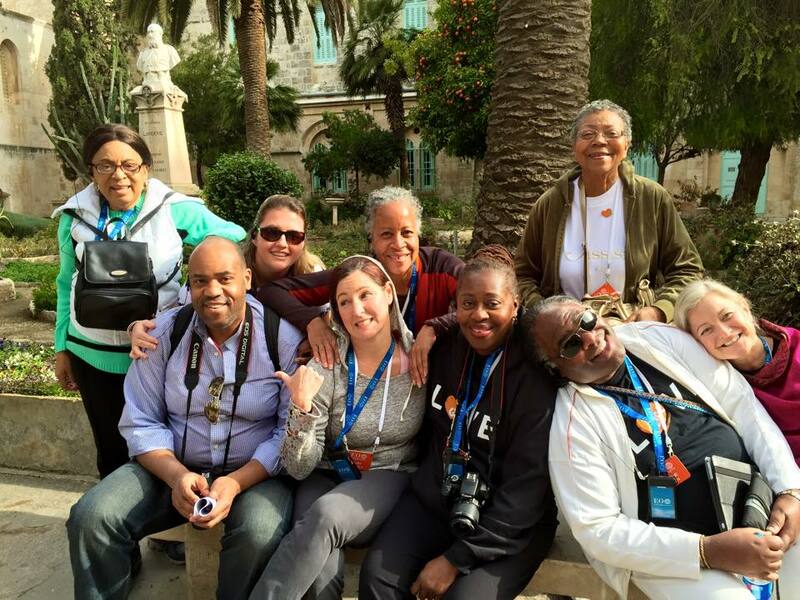 I traveled with the Orange group the whole week. A little side note about the group. We were not all from the same state. We were made up of three groups. We had a group from Texas and one from San Francisco and then our New York group. We were also not all Catholic, just the New York group was. The other two groups were either Methodist or Presbyterian. It was great to have the different view points. Our days touring were mainly walking or riding a bus for short time before walking. Our first day touring. January 22, I was excited about the places we were going that day because I have learned and taught about some of them many times. 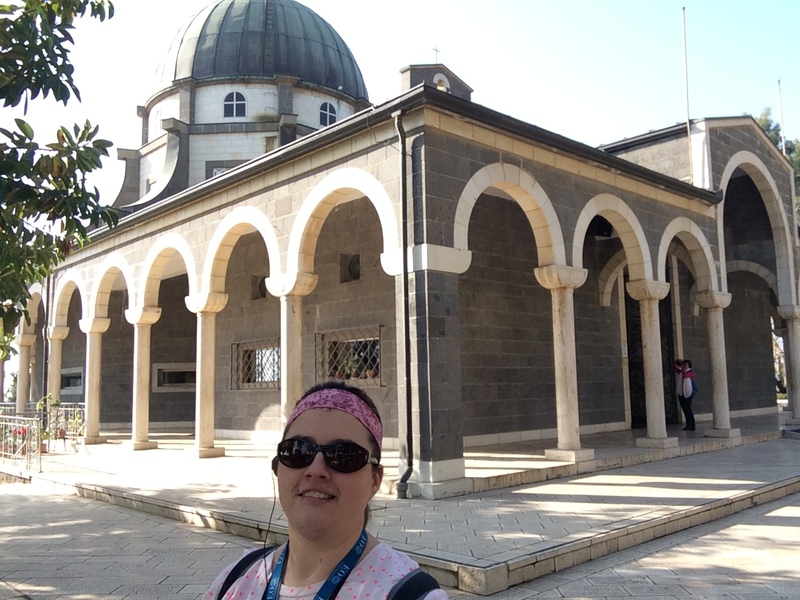 Our day started out at the Mount of Beatitudes. There was a very pretty Church there. 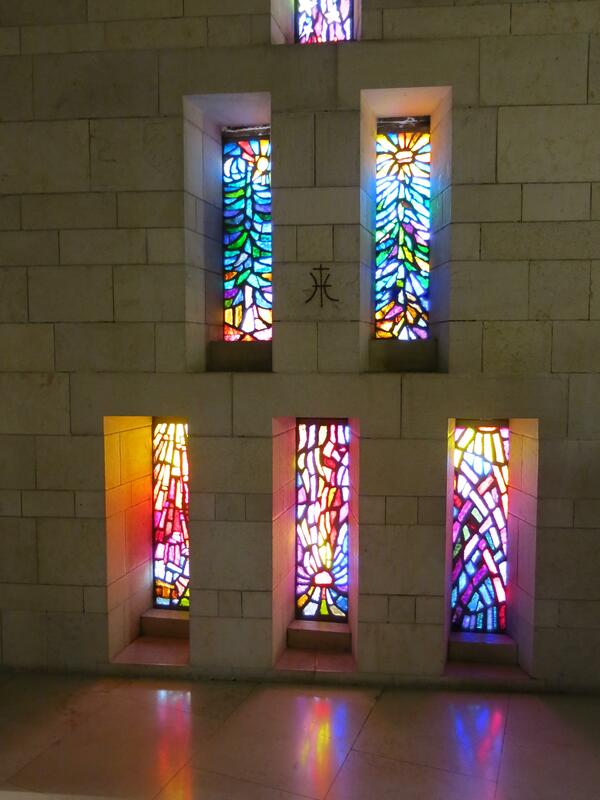 Its dome had eight sides for the eight beatitudes. The next place that we visited I was very excited about. I had taught and learned about this miracle many times. It is one of my favorite miracles too. 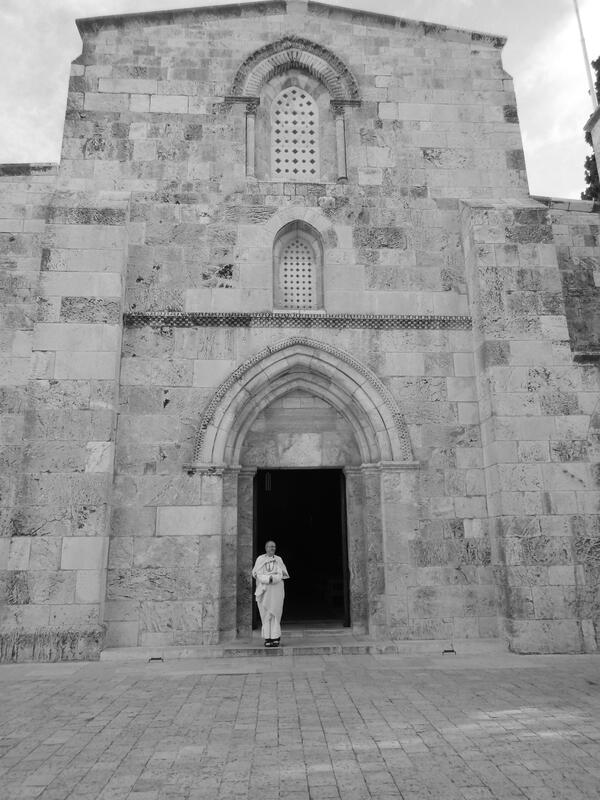 Tabgha or the Church of Fish and Loafs. 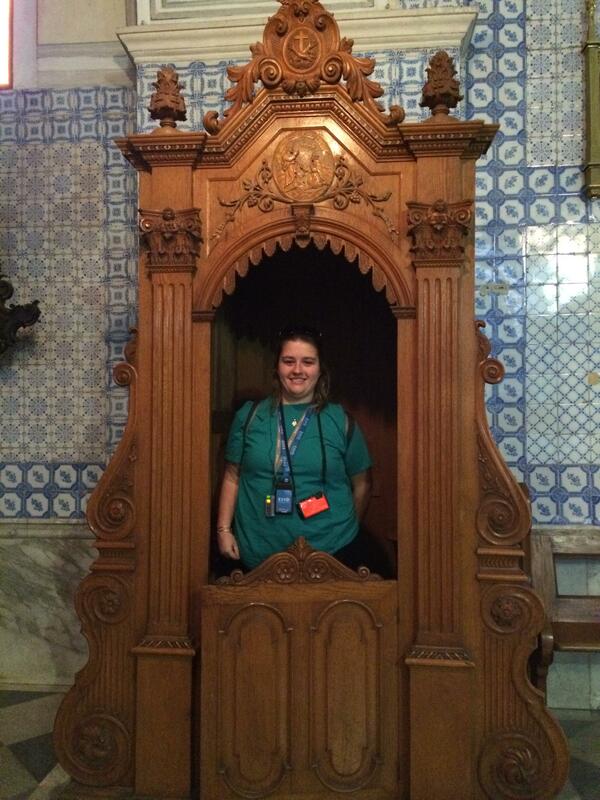 This is where Jesus multiplied the fish and the loafs for people to eat. It was pretty cool standing somewhere that I knew a lot about. Knowing that Jesus preformed a miracle right where I was standing. He shared food with strangers even though He could have just told them to leave and go into town. I have always believed that sharing a meal with people brings you closer together. 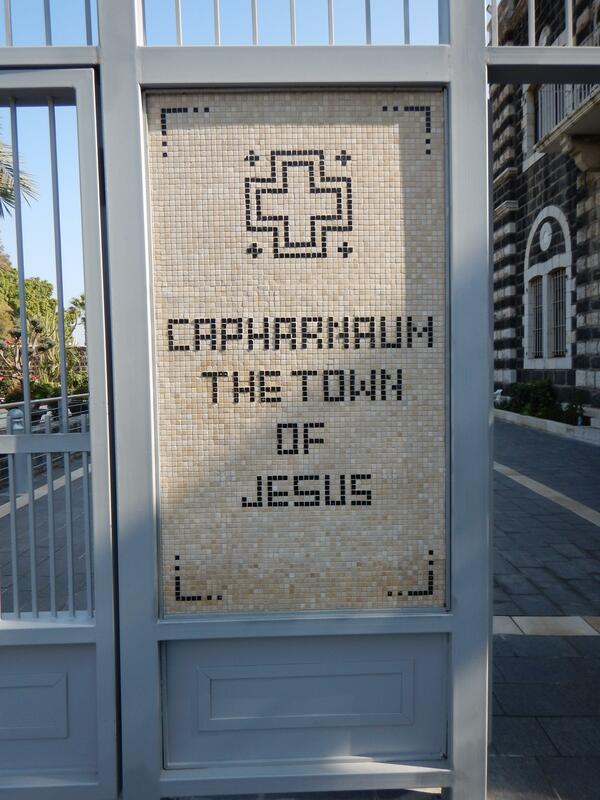 We also went to the Church of the Primacy and Capernaum before lunch. The Church of the Primacy is where Jesus and the Apostles had breakfast after catching a multitude of fish. Capernaum was where Jesus lived after He left Nazareth, He healed the paralyzed man that was lowered through the roof here. One of my favorite stories too. Peter’s house was also here. The next thing on the plans was a boat ride on the Sea of Galilee, where Jesus walked on water and made “Fishers of Men”. The view from the boat was just breath taking. I have always loved the story when Jesus meets some of the Apostles for the first time and tells them that if they “follow Me and I will make You Fishers of Men.” Just knowing that took place right on the banks was exciting. I have taught my kids many times about Jesus walking on water and we have reenacted it to the best of your abilities and I was right where that happened. 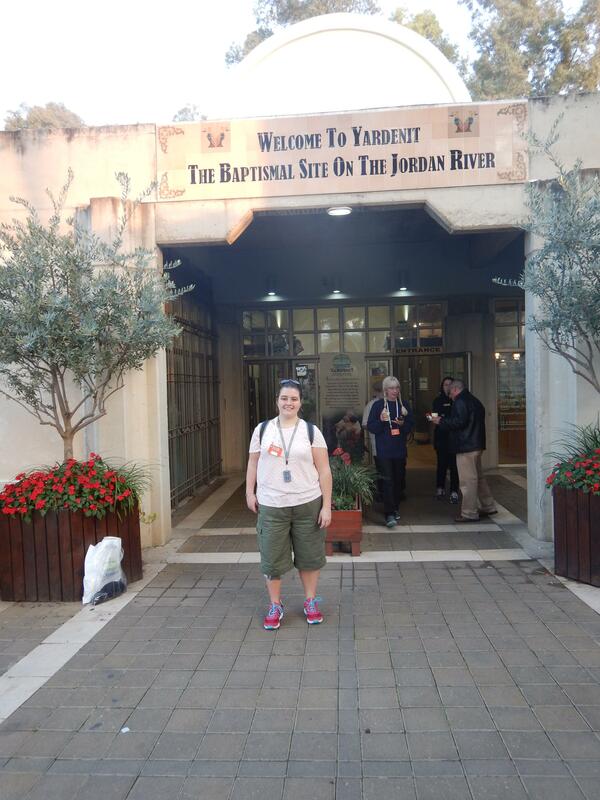 The last stop for our first day was the Jordan River. 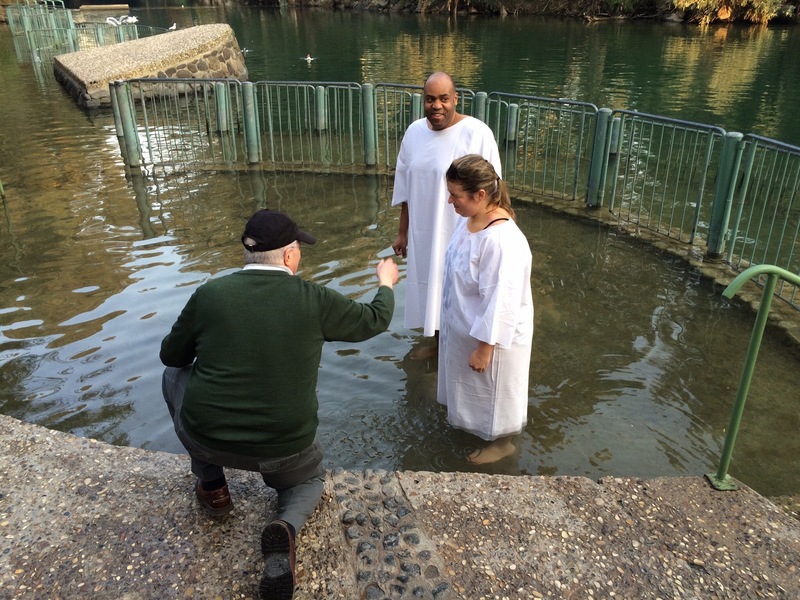 This is where Jesus was baptized in the river by John the Baptist. My new friend Sidney and I decided that we wanted to renew our Baptismal promises in the river. 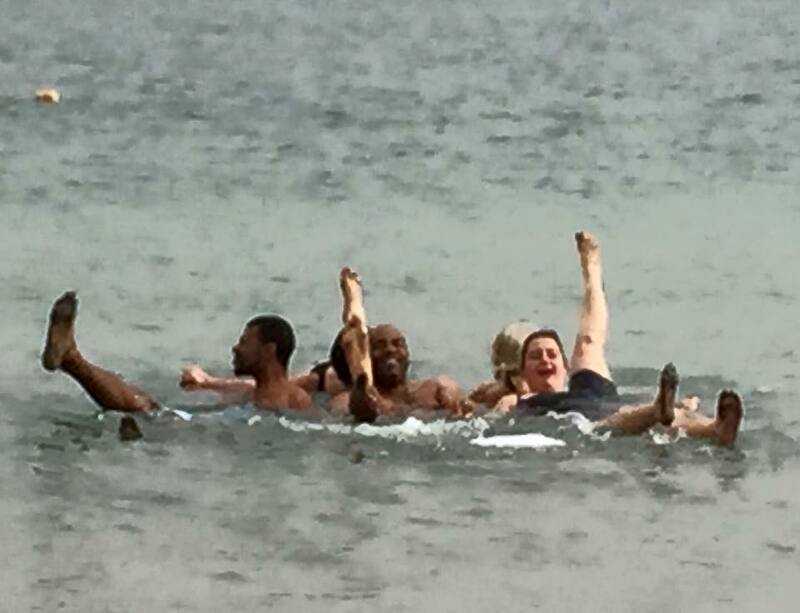 We did just that, in the cold water. It was one of the most amazing feelings. After all the things that I have been through in the past five years it all lead to this moment. At the Easter Vigil about five years ago I became a full member of the Catholic Church by choosing to be Confirmed. From that moment on my Faith has done nothing but grow for so many reasons. My hip being a big part of that time in my life being diagnosed, to knowing I needed surgery, to having surgery and then recovering. I knew my faith would help on that whole journey. My Faith was there through thick and thin and God was there too. To renew a promise that I had done for me when I was an infant was amazing. To know that I did something Jesus did too was more than words can describe. I could just imagine how Jesus felt coming up from that water. What a great way to start a trip. Today, so many new friends were made that I will have for a life time. 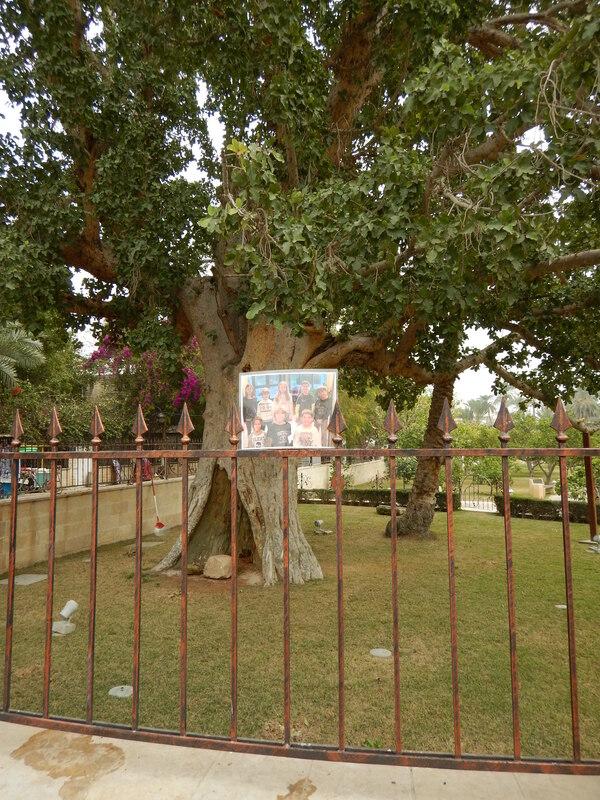 January 23, our last day in the Galilee area. 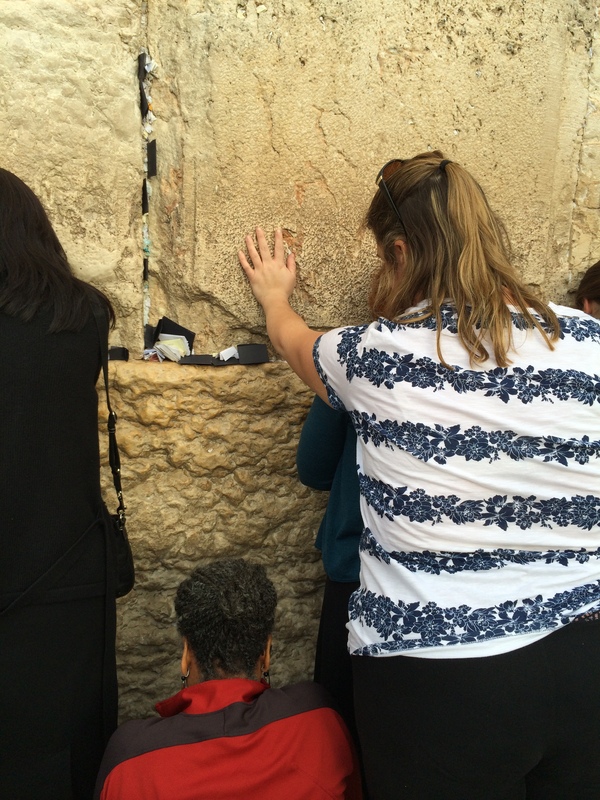 We headed for another place where Jesus performed a miracle. 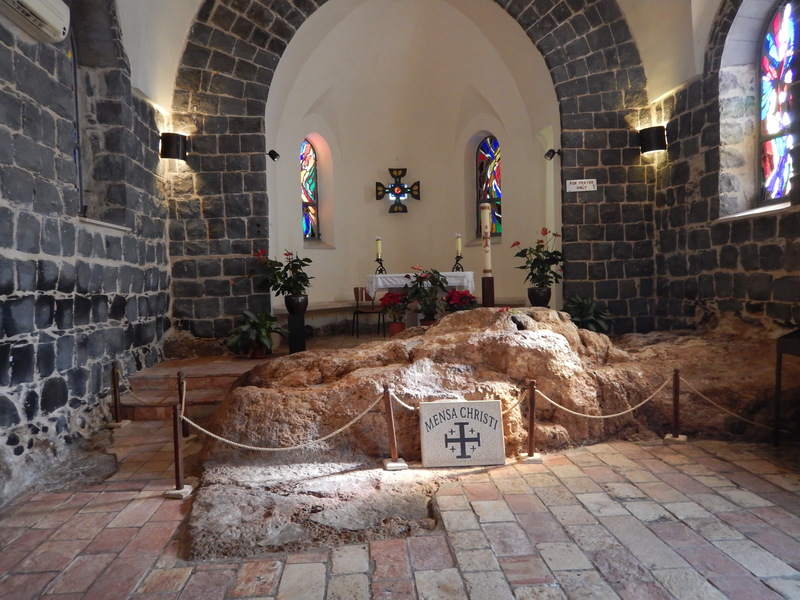 Cana where He changed water into wine at the Wedding feast. The Church was simple but beautiful. 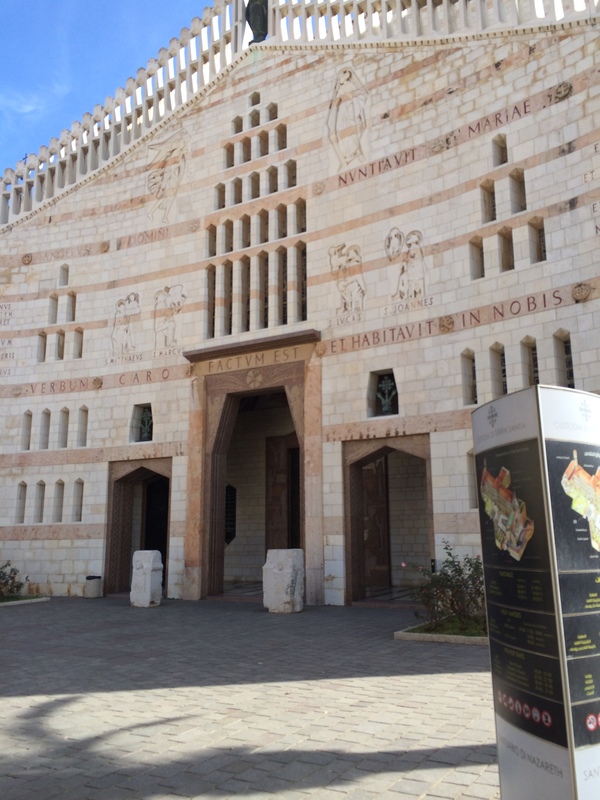 We then headed of to the Church of the Annunciation is the place where Mary learned that she was going to be the Mother of Jesus. This Church was very moving for me. I saw a picture of the Holy Family and was moved by it. I have always loved that Jesus had an adoptive Dad just like me. This picture reminded me how lucky I was to have the family I do and that God picked my family for me just like he did Jesus’. Joseph was the first famous adoptive parent and choose freely to love and care for Jesus as his own. It was a very beautiful Church too. 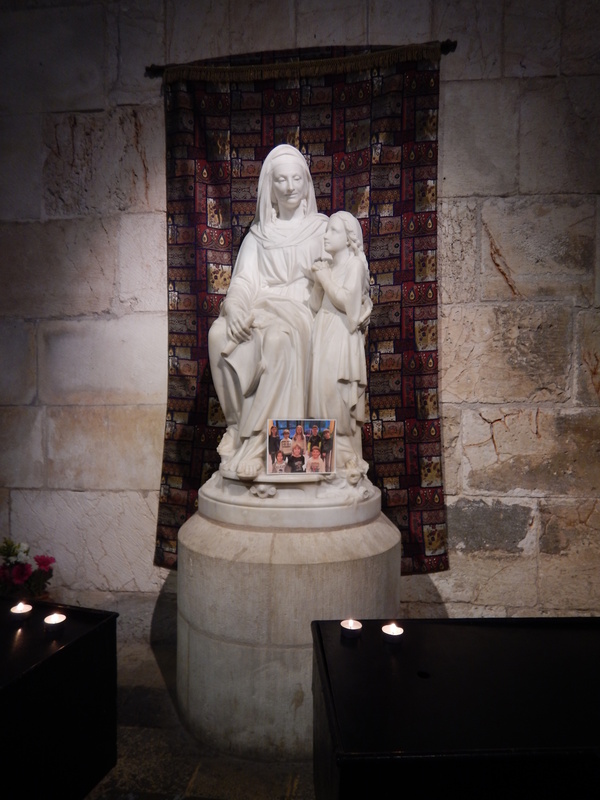 There were so many pictures of Mary and Mary and Jesus that I felt the love all around. The next stop was going to put my hip to the test and I didn’t know ahead of time, while maybe 10 minutes before. I have always lived my life, I will try something before I give up and this moment was going to happen right now. I wanted to participate in everything that we were doing this week nothing was going to slow me down. I wanted to experience this trip just like any other with life in hand and no walls in the way. We went to Tel Megiddo. This is a man made hill, that is where the word tel comes from. This was a cool place to see, people had been living there for a long time. I don’t much about it other than the battle of Armageddon is going to take place here. The challenge started here. First we had to climb to the top. Yes there was a path just a short hike nothing like Diamond Head at all this was easy. Once we were up there it was shared with us how we would be exiting this site. 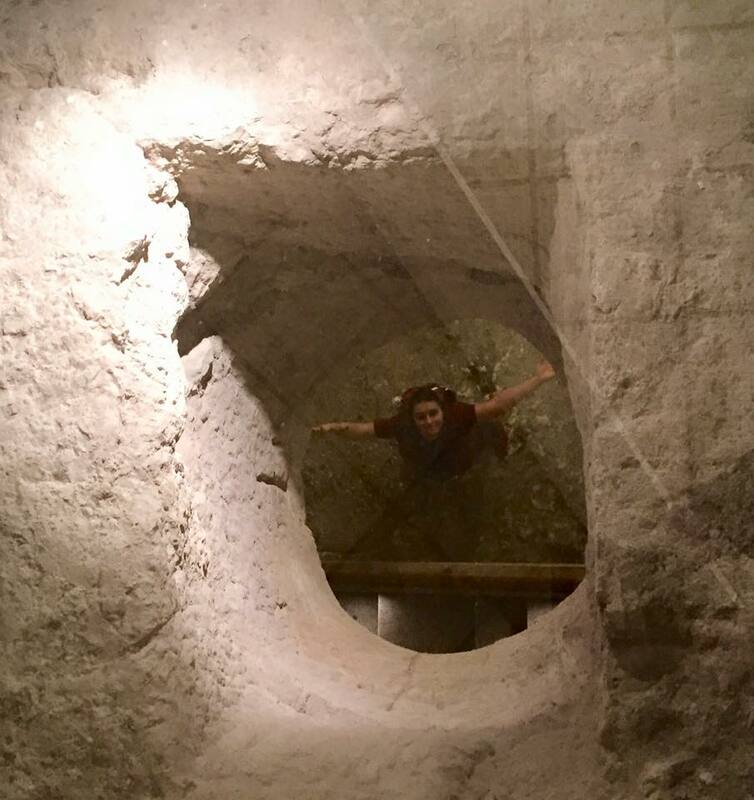 We needed to descend 183 steps to exit through a water tunnel. At that point only one person really knew about my hip or disability and it was not Sidney. I was wearing my Bioness so they might have figured out that something was not right but didn’t fully know. Sidney who I had become to know in this short time was a great help. I asked if there were points with no railing could I use him for balance he said no problem and we went down those stairs together. I did learn and teach everyone that it was easier to go down the stairs side ways. Many people were happy that they put the slowest person in front, me of course. It was great that Sidney was there, there were many points with no railing or places that I could hold onto well. The stairs were stone and very narrow. They were even hard for Sidney at points. If going down that many steps wasn’t enough we also had to climb 83 to get back out. That was ok Diamond Head put me in great shape for that 99 in one shot. 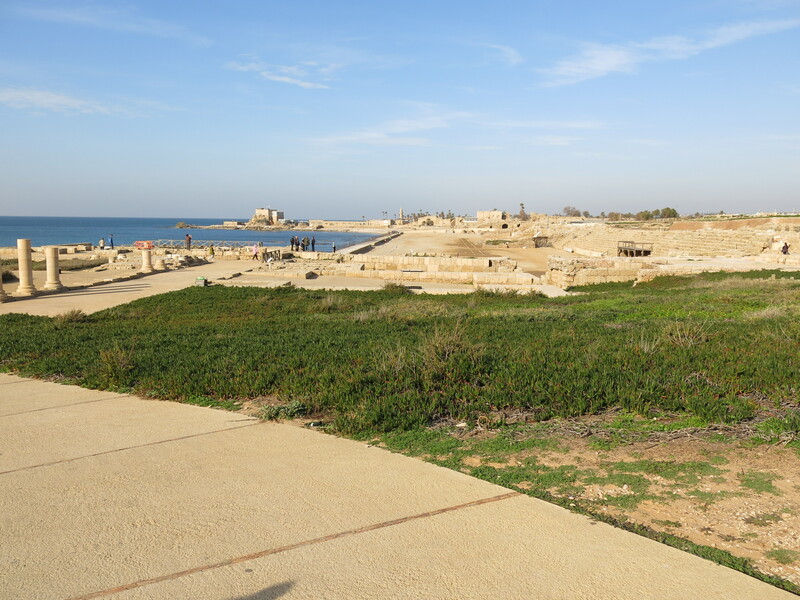 After that great experience we headed for Caesarea a place that Herod built and named after Caesar. 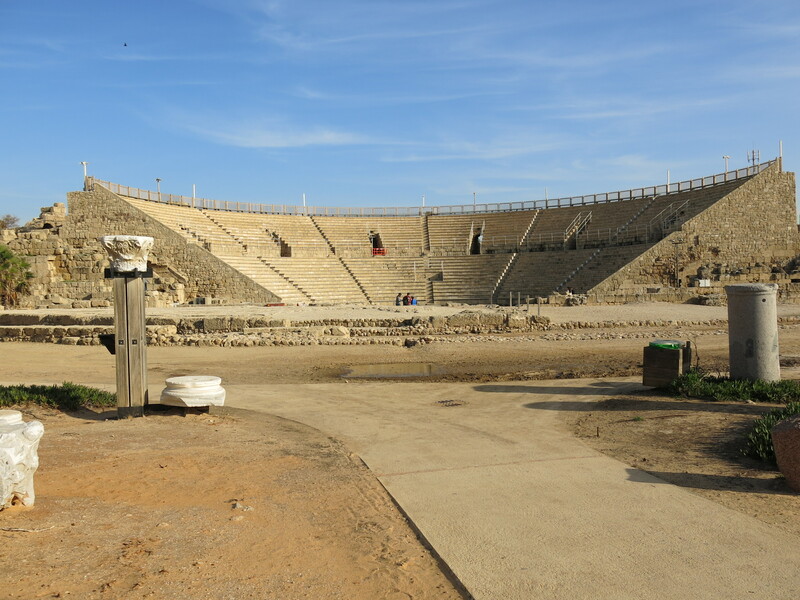 It had a theater, a port and even a place for chariot races. It is located right on the Mediterranean Sea. We were able to make a stop at the sea. Once again Sidney and I hopped right in. Just up to our knees but I couldn’t miss getting in. I love water and feel the need to touch all the different bodies of water I get near. We went to our new hotel. By this time it was Friday night and the Jewish Sabbath had started and it was interesting to experience. I know a little about it from things I have learned but not much. It was nice to see that people really do follow their religion. The Jewish people were walking every where and not use electrical things. We also got to see part of a Seder. We were now in Jerusalem and would be there the rest of the trip. January 24, today part of our trip would take us into Palestine. First thing we’re headed for Bethlehem. 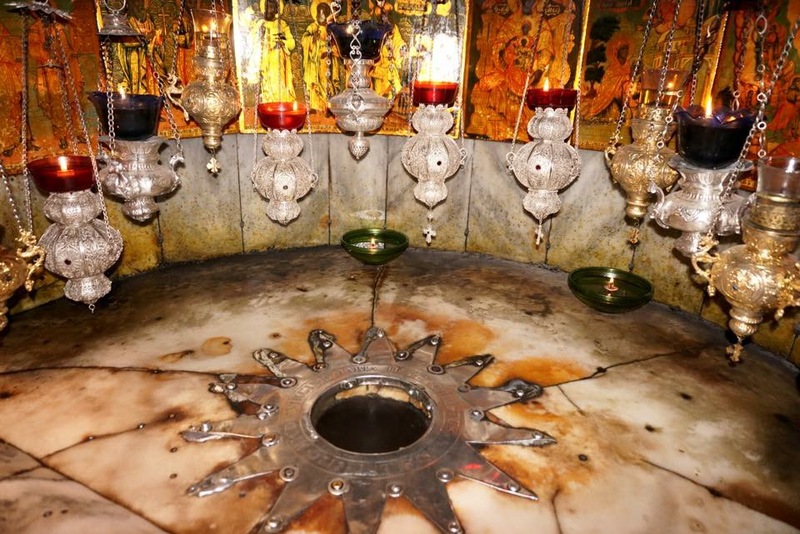 The city where Jesus was born. 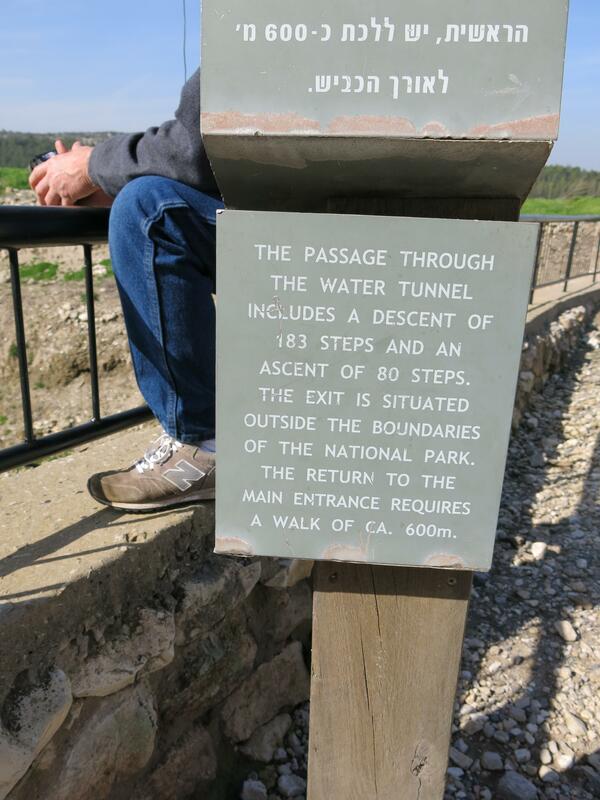 Entering Palestine for me was no big, just like crossing state borders. There were checkpoints but we were not stopped. 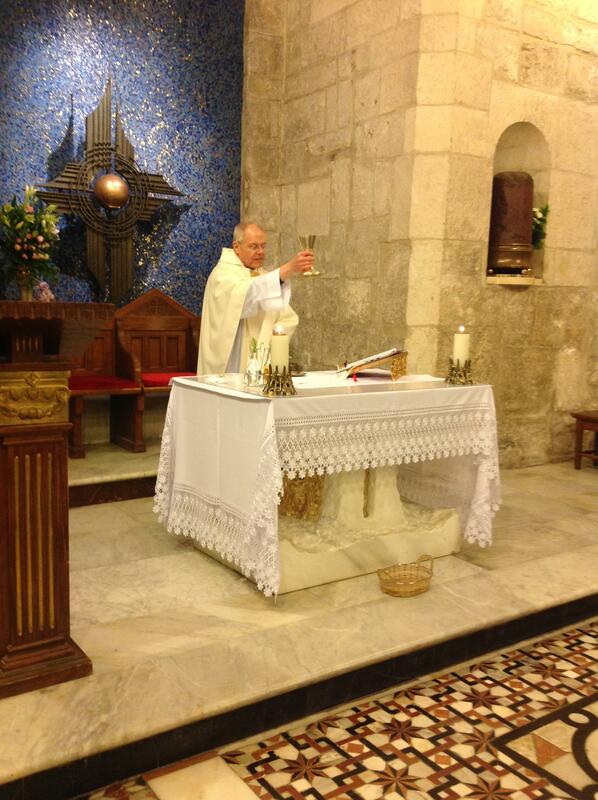 We were headed for the Church of the Nativity that houses the place where Jesus was born. For many Americans we picture Jesus being born in a stable (which for us looks like a barn.) 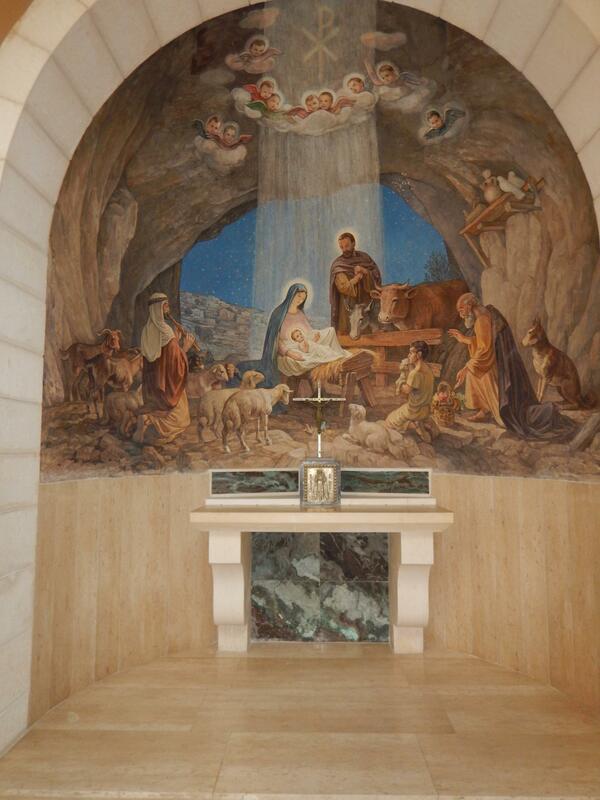 Jesus was born in a stable and in Israel that is a cave. 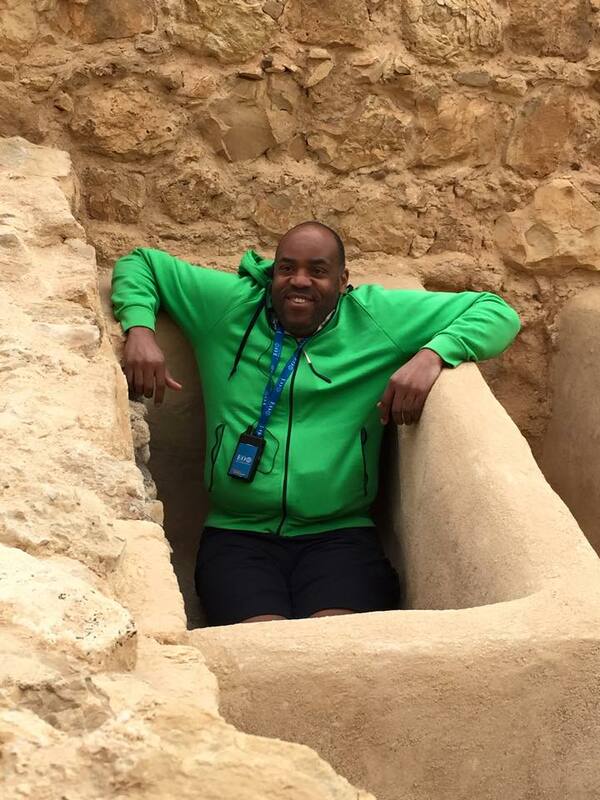 Yup I said it a cave and laid to rest in the manger. This Church was under restorations so we didn’t see much. We entered the cave which is located under the Church down some narrow stairs. The cave was bigger then I thought. We sang Silent Night there and I got the goose bumps. 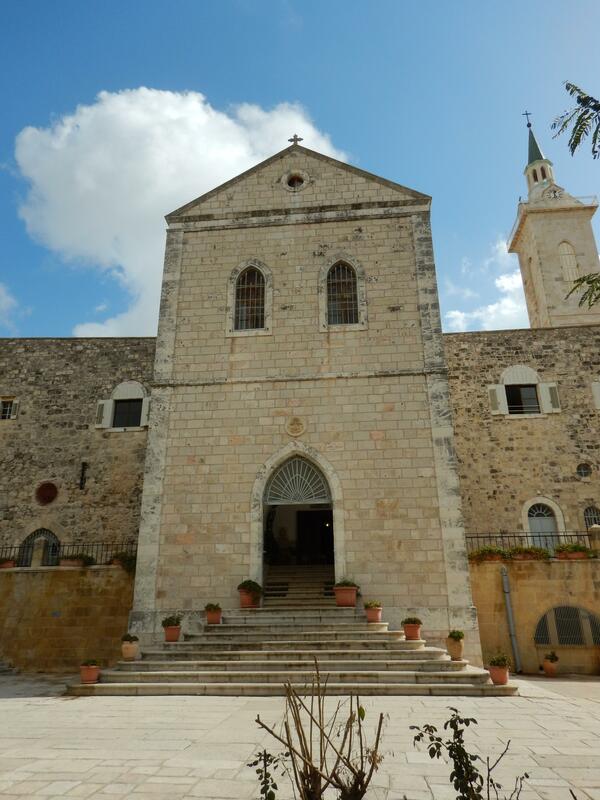 Right next to the Church of the Nativity was St. Catherine’s Church which houses where St. Jerome, lived underground to stay cool and was buried before being moved to Rome. Pretty cool. As a side note St. Jerome’s was one of the Churches that I belonged to and was the Church that I was confirmed at, so I know a lot about him. 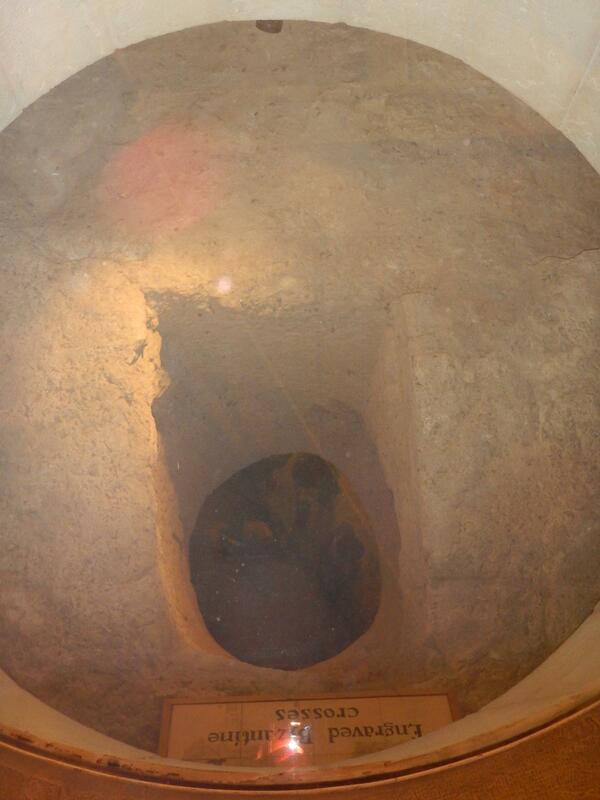 It was so neat to see where he translated Bible and was buried. Shepherds’ Field was the next stop for the day. 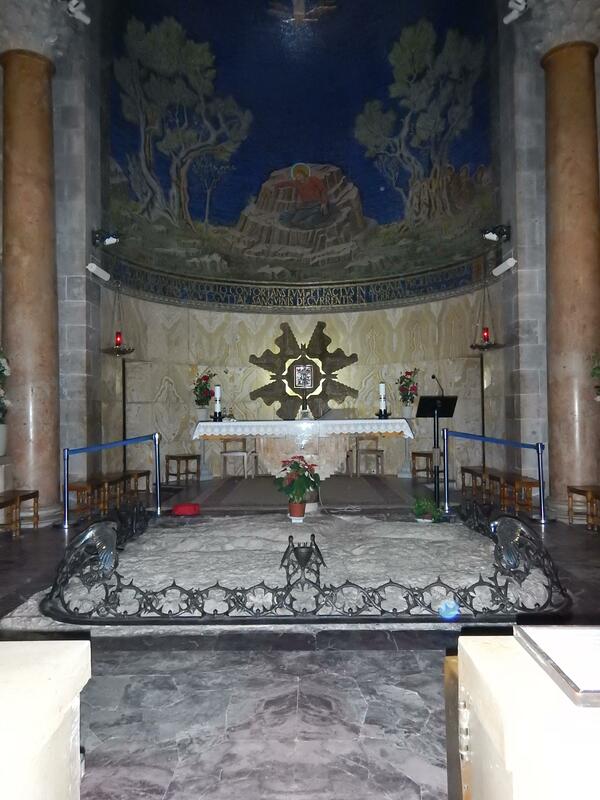 This is where the shepherds’ saw the Star of Bethlehem and followed it to the new born king. 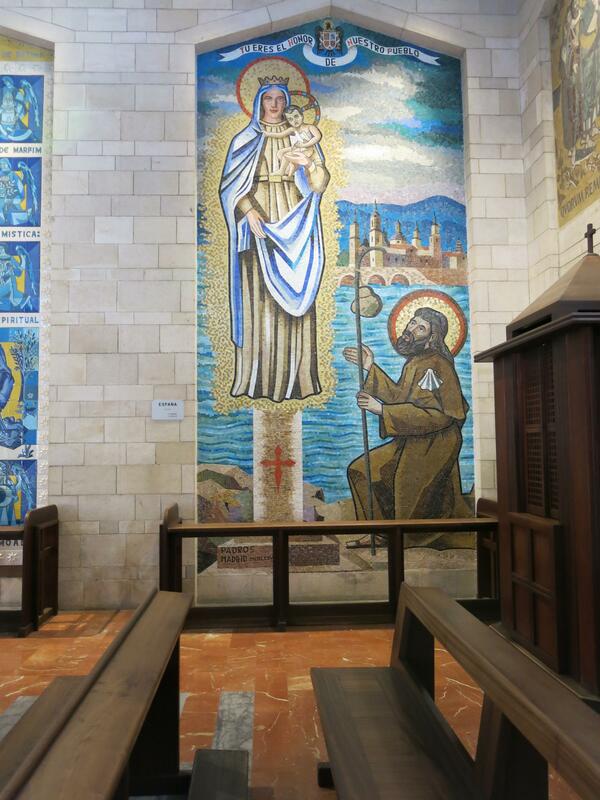 A simple Church that had some beautiful paintings on the walls. The next stop was going to once again put me to the test, being my hip and knee. Time to hike yet another Tel. We were going to Herodion. 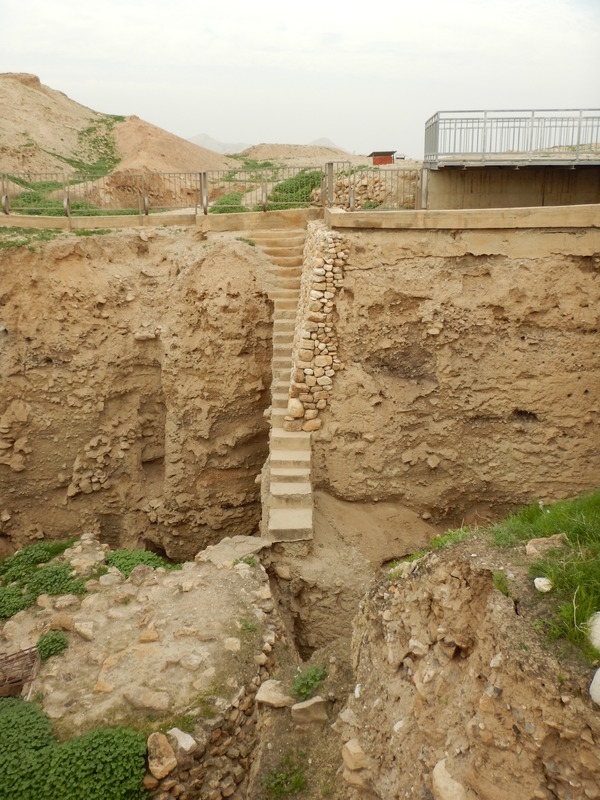 Yet another place built by Herod. 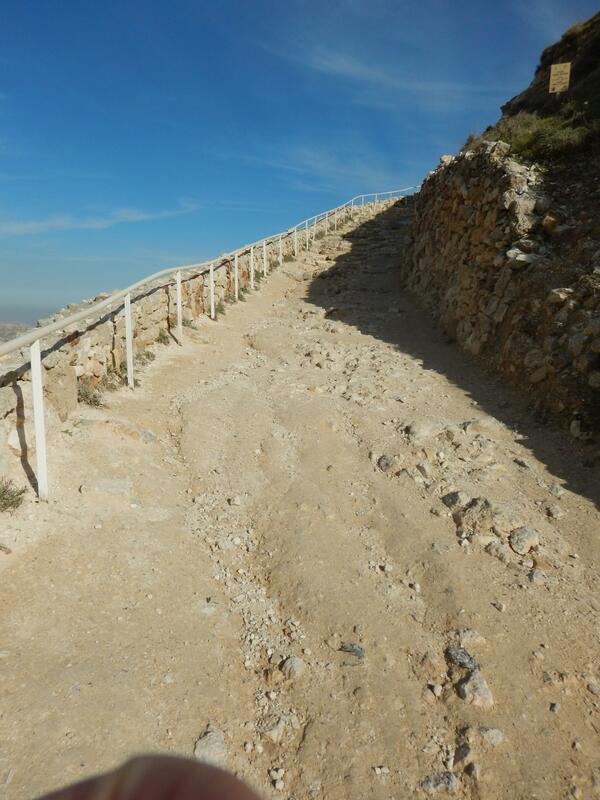 It was a longer walk to the top with rough paths. Up I went leading the way, that way I could go at my own pace and listen and keep walking when people stopped. I did great. Once again Diamond Head had put me in great shape for all of this. I was having fun and learning so much. The view was so worth the hike up there. 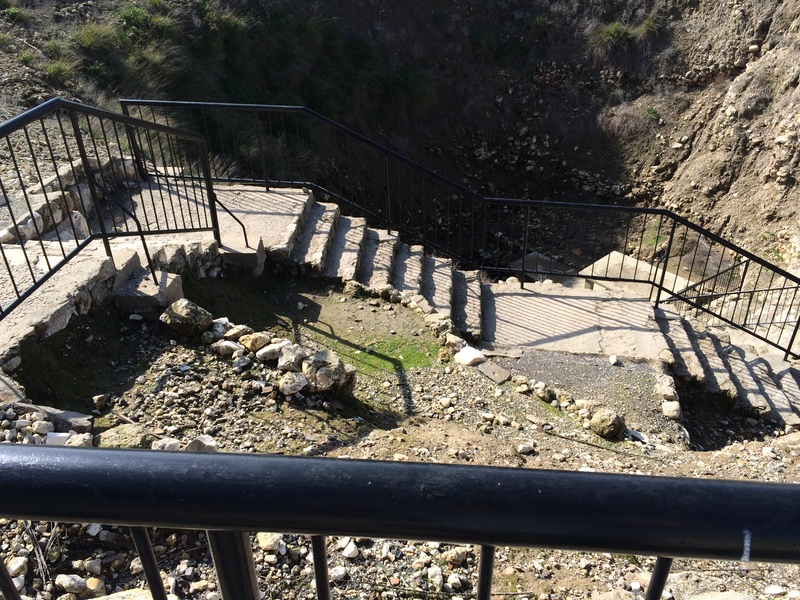 Once again a few stairs to descend with very few railing, thanks Sidney for the great help. The last stop for the day was something that I was looking forward to. 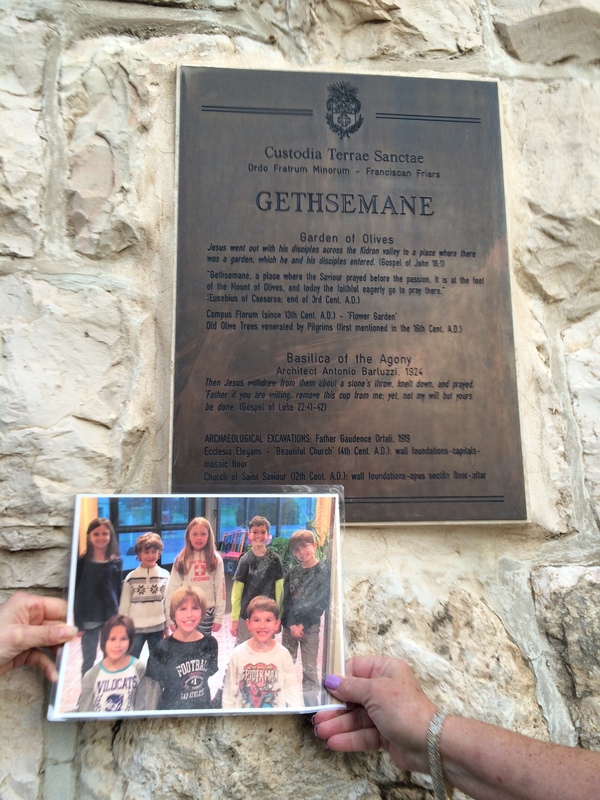 We were headed for the Garden of Gethsemane. 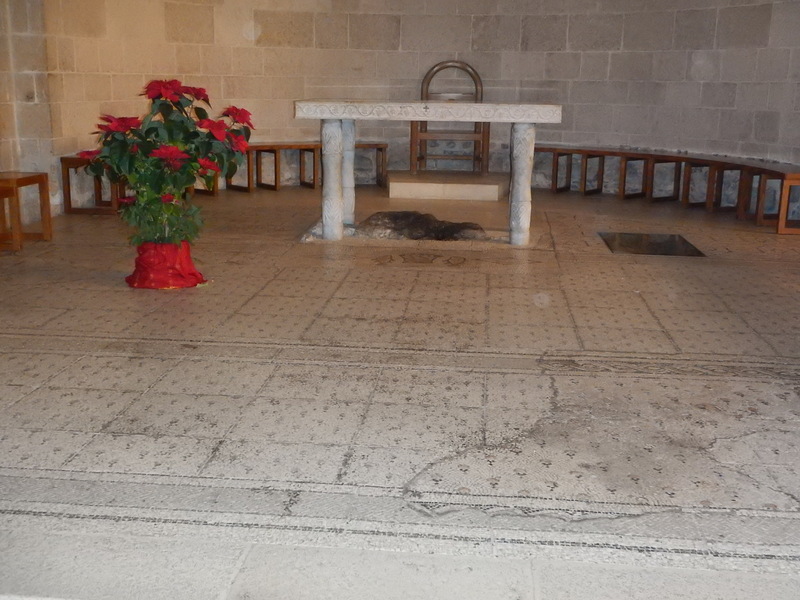 This is where Jesus prayed the night he was betrayed. He prayed to His Father. Jesus asked if He didn’t need to die but said “let your will be done.” I have taught and learned so much about this place. 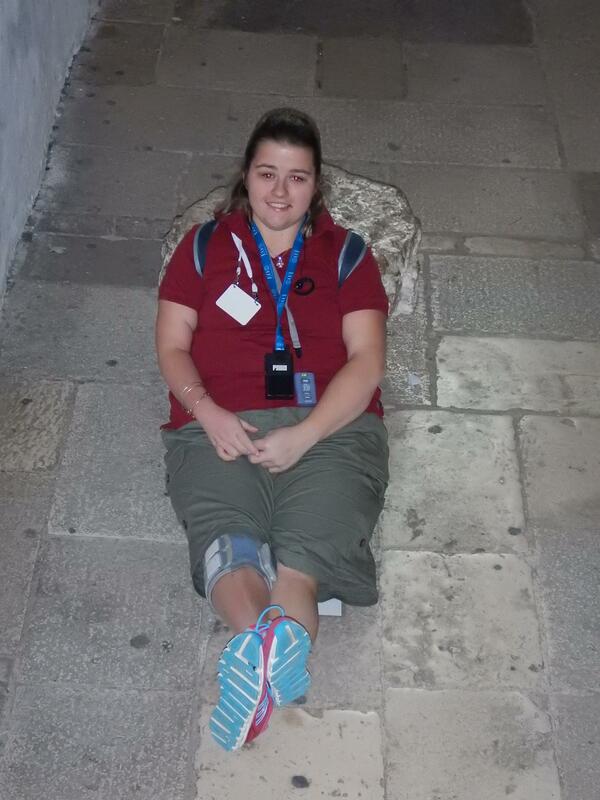 It was able to kneel and pray in front of the rock where Jesus prayed. I just took in this moment. 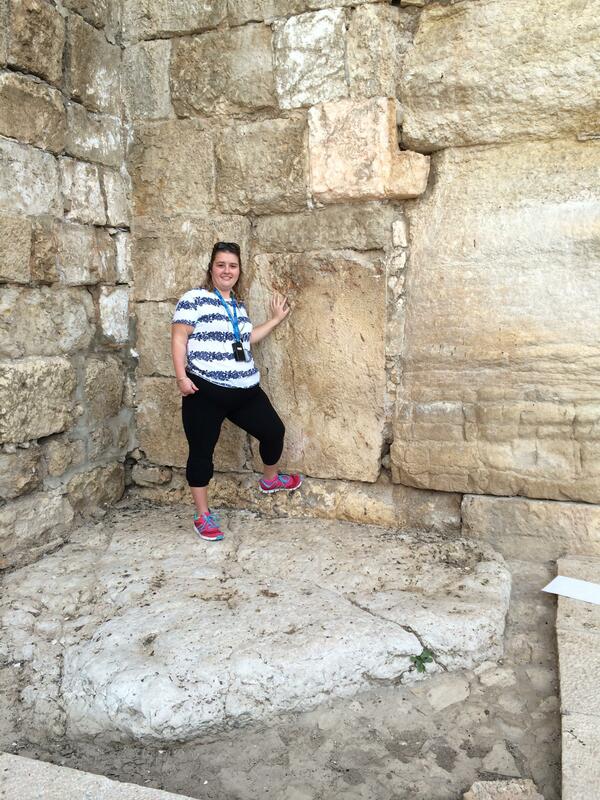 I was standing where Jesus stood, doing something He did. What a way to end the day. January 25, today was going to be the ultimate test for me. We had so much planned for today and it involved a lot of walking. Words can’t say how much walking we did that day. I wish I knew how much it really was. 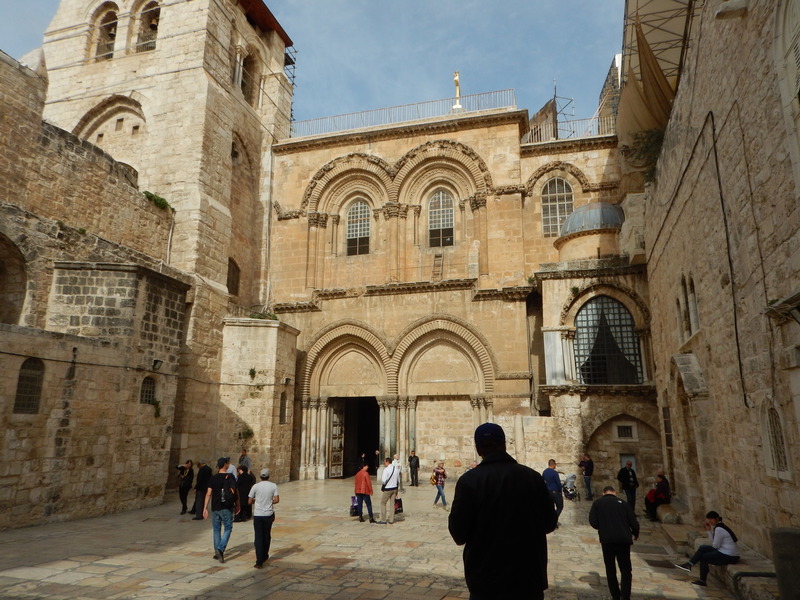 We were headed into the Old City of Jerusalem and started walking to our first stop for the day St. Anne’s Church and the Pool of Bethesda. They are the same place. 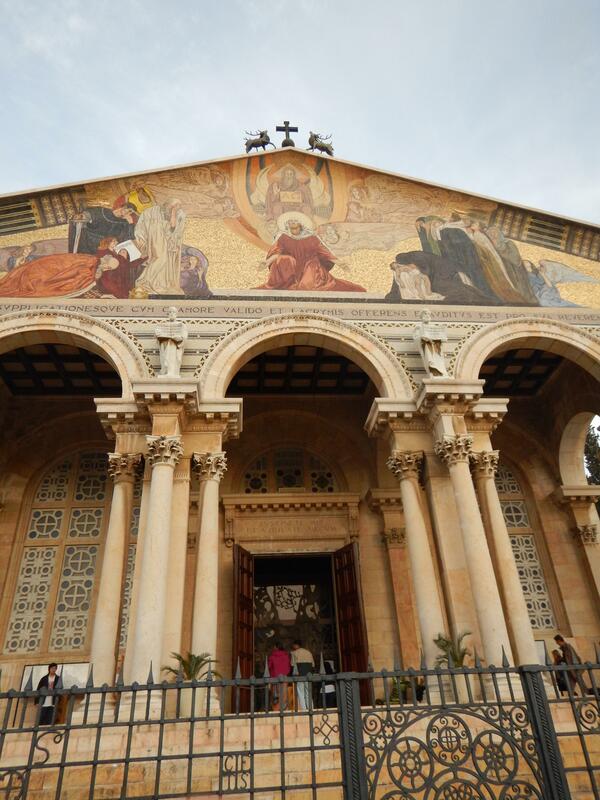 St. Anne’s Church is where Mary Jesus’ mother is said to have been born. It also has some of the best acoustics in the world. Yes we did sing there. 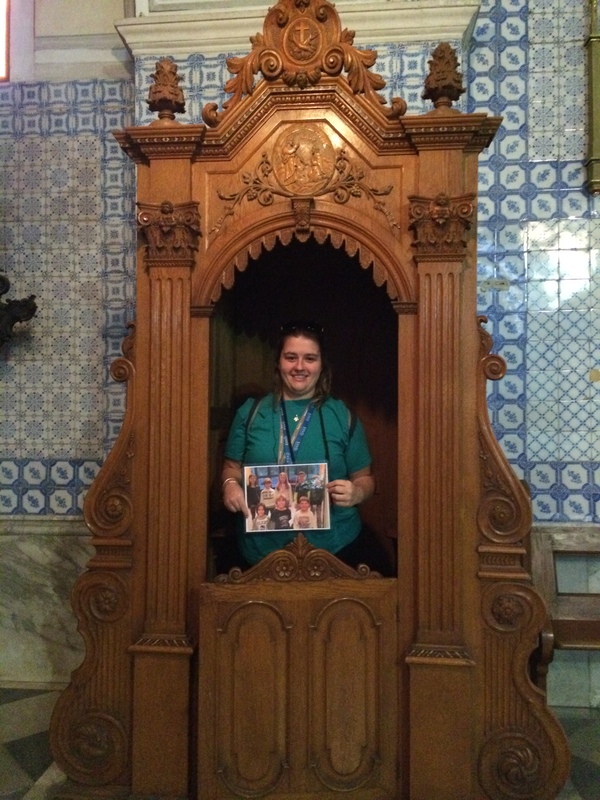 The neat experience there was coming up from under the Church I heard a group sinning Ava Maria. It was so beautiful, I wish I had videoed it. 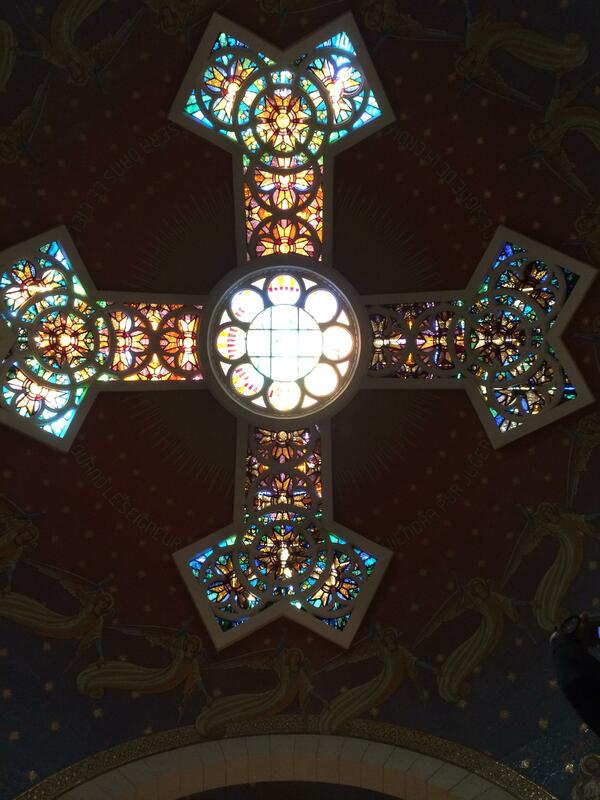 The Church was just beautiful, inside and out. 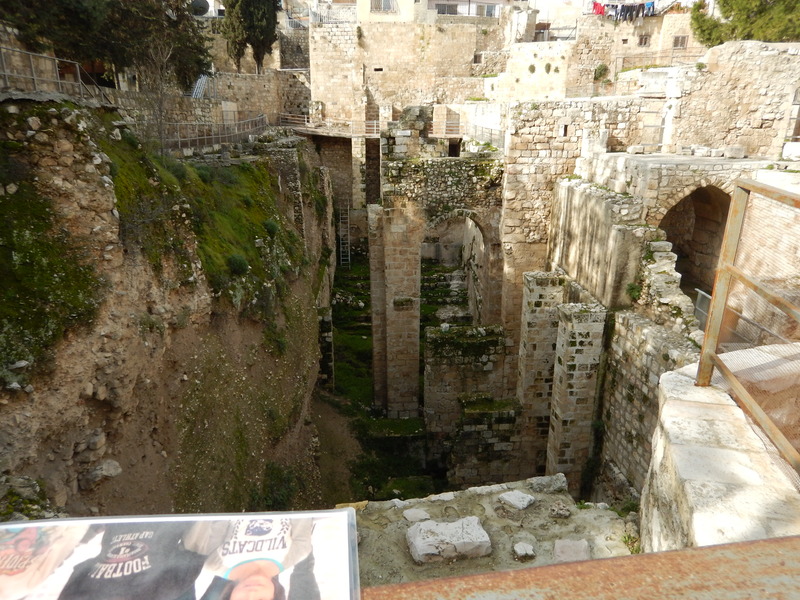 I headed to the Pool of Bethesda where Jesus healed the man that had been disabled for 38 years on the Sabbath. To know that Jesus choice to help this man when no other would is interesting to me. As a person that has a disability, I find it strange that there are many people out there that judge us for no reason and refuse to see us for who we are. They just see that we are different and look the other. We are not all meant to be the same. Jesus saw this man when no other would. What a great felling. I know I have been seen by God many times. Not that I ever want to be fully healed. I love who I am and that I have this challenge to face. 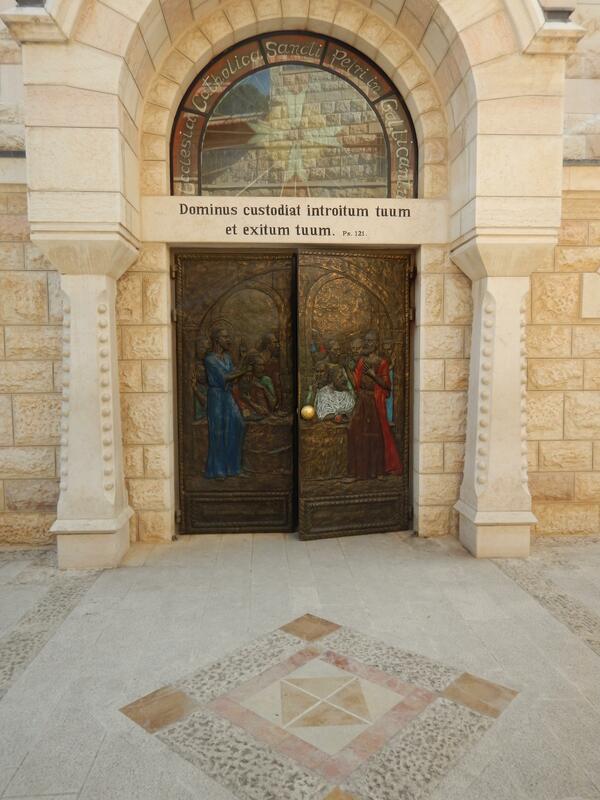 After our stop at St. Anne’s we were headed for the start of the Via Dolorosa or the Way of the Cross. As a Catholic our Faith is based on many things and this is one of the most important. It was a moment that I was looking forward to. 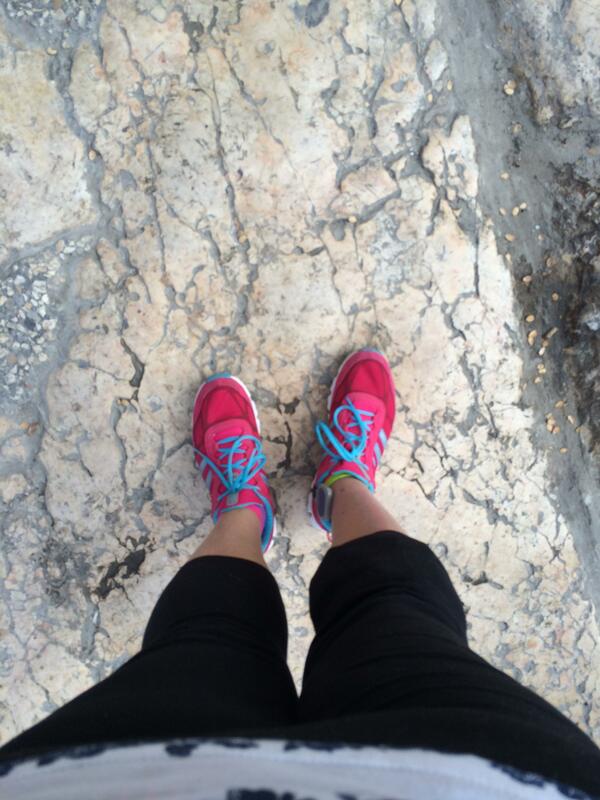 I was going to be walking in the footsteps of Jesus during one of His most trying times. 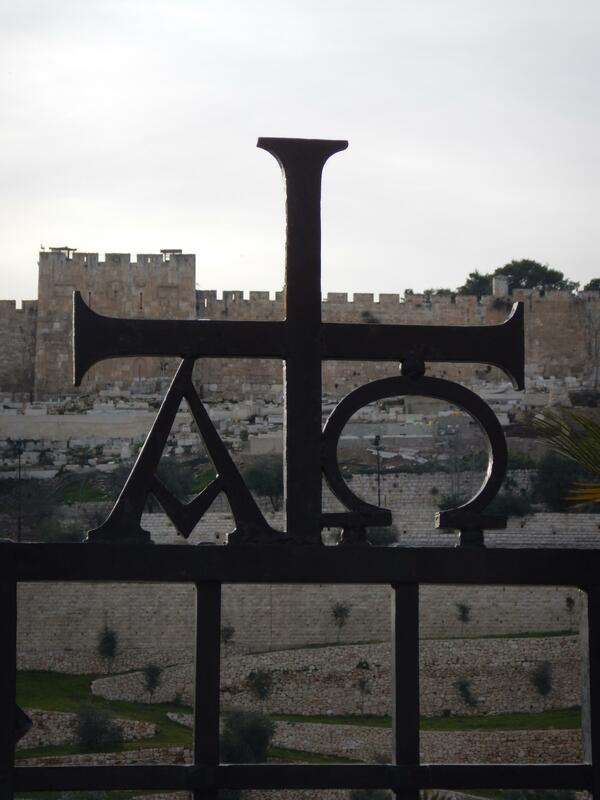 For those that don’t know the Via Dolorosa is the path that Jesus walked with His cross to His death. There are 14 stations along the way. Starting with Jesus being condemned to death and ending with Him being placed in the tomb. Choose to believe it or not I was walking a path that Jesus Himself walked. He took on the burden of dying for our sins. I had the most amazing experience and was very proud during this time. Believe it or not 31 years ago my parents were told that I would never walk do to sever Cerebral Palsy that I would have from my brain bleed. I slowly lost the ability to do things before I had my hip replaced, I watched my world got smaller and smaller, losing the ability to do things. I came through a long recovery and became stronger than I have ever been. I pretty much during this time had to learn how to walk the right way for the first time in my life. So to be at this place at this moment in my life was great. Today I was walking with Jesus. Step in step together, each of us carrying our own cross. I could see and feel how difficult it would be to walk the path He did. I even almost tripped like Jesus did. I was doing something that many people told me I would never do. I cried tears of joy, knowing that I was doing something that just 4 short years ago would have been almost impossible or would have cause me so much pain it wouldn’t have been worth it. I cried because I knew Jesus choose to do what He did to save the world. I cried because God loved me enough to give me this disability and that I am conquering it. I was there and walking, I felt both God and Jesus there with me that day. We walked side by side that day as we have always done in life. He wanted me with these people and at that place for a reason. He has a plan for me, I might never know what it is and I am ok with that. Words will never fully explain how I felt at that moment. 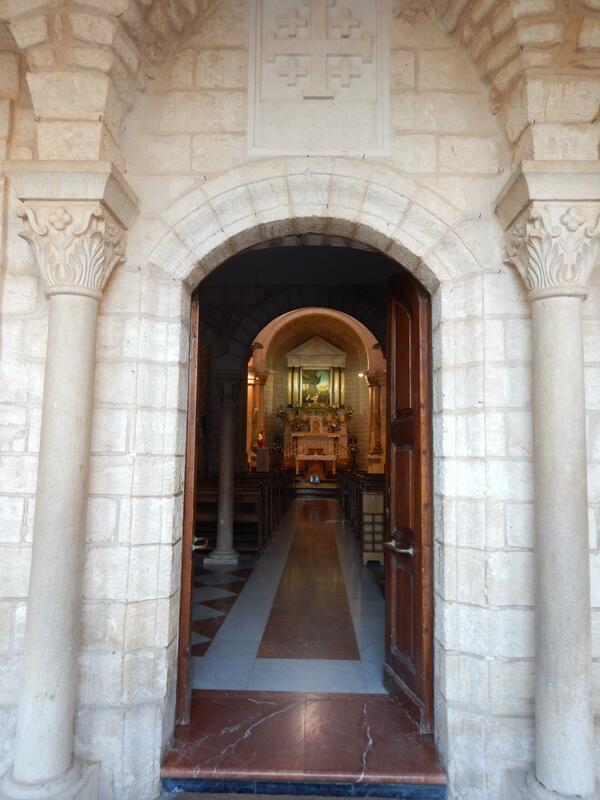 At the end of the path is the Holy Sepulcher Church which houses 3 of the stations. 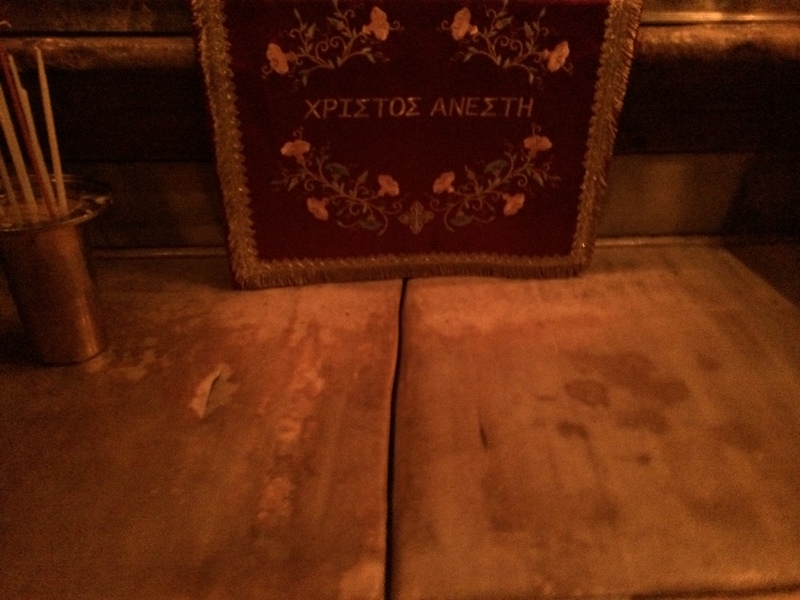 The place where Jesus died, the stone that they prepared His body on for burial, and the tomb He was buried in. We were in line to go to the tomb and were given a great surprise. 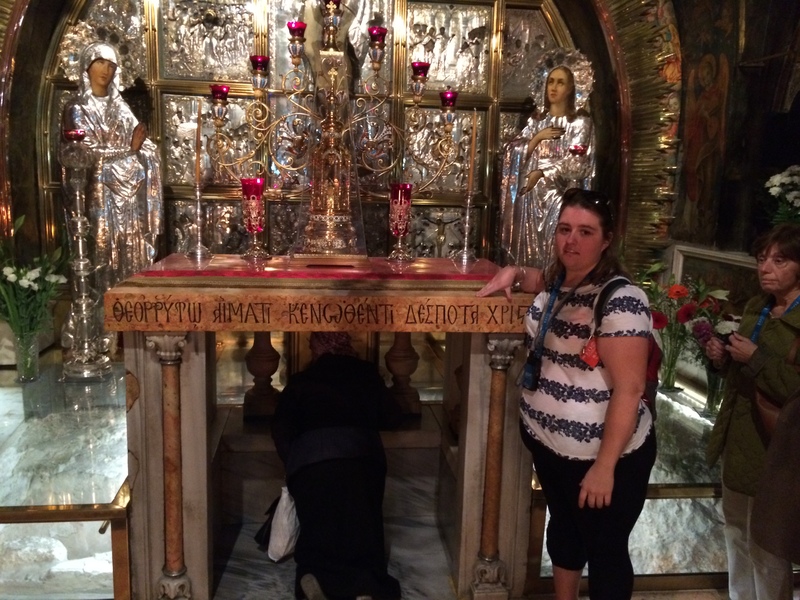 We were going to be having Mass (it being Sunday) FEET away from the tomb of Jesus. What a great surprise. 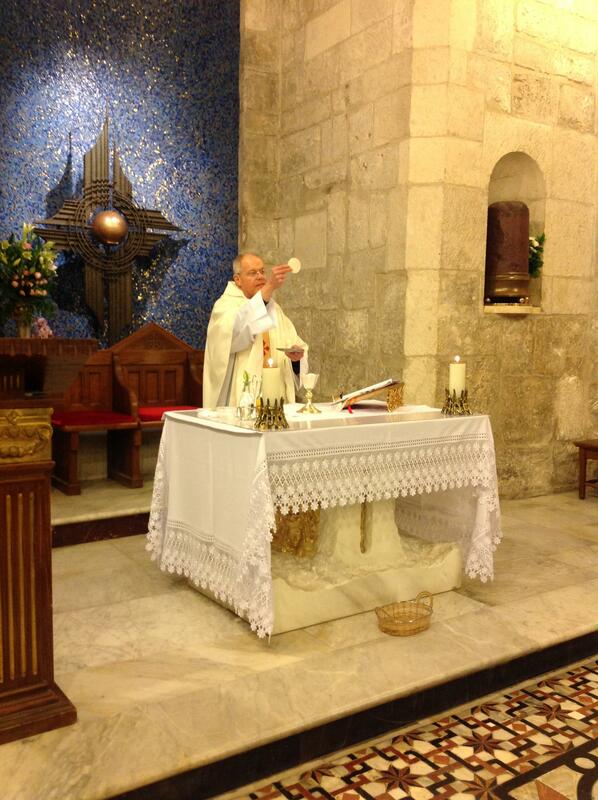 After Mass we visited the tomb, and the two other stations in the Church. 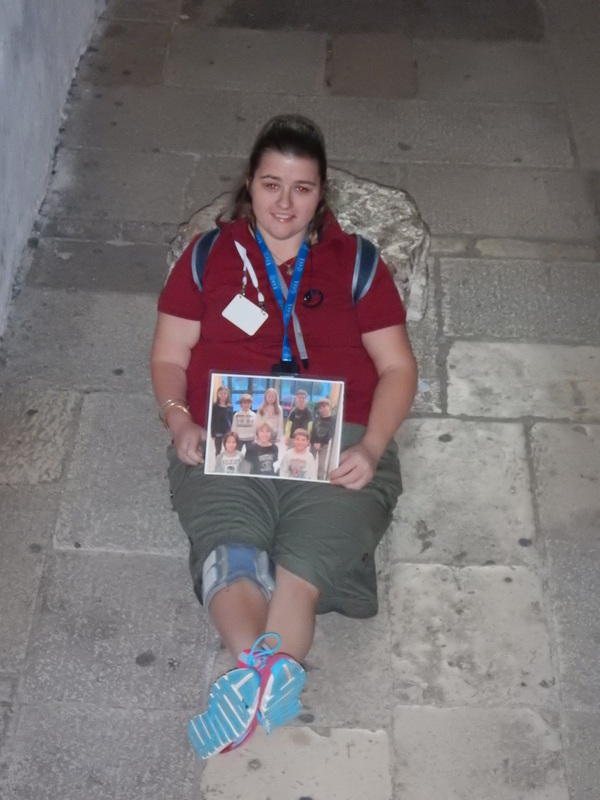 Being in this place where Jesus died was interesting. I still fully don’t know how I felt at that Church. 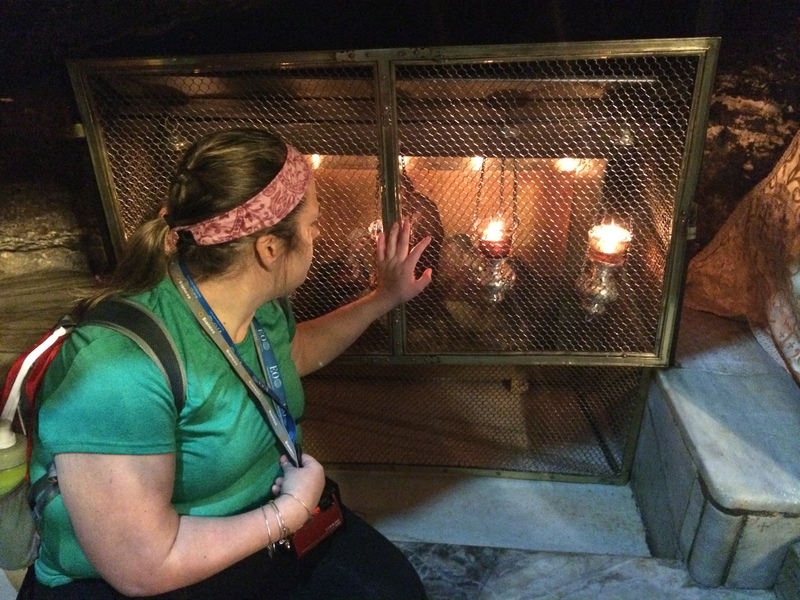 When we set foot in that tomb I felt that it was the right place, I could feel God in there, it didn’t feel empty, even though it was. What a great way to start the day. Yes I said start the day was not over yet. 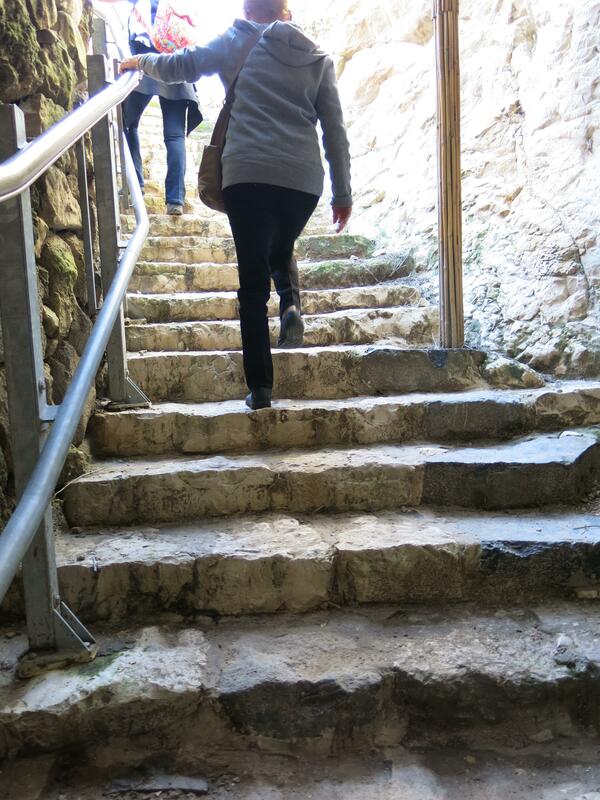 We were headed for the teaching steps and the Western Wall.The teaching steps is where Jesus taught many of the parables. 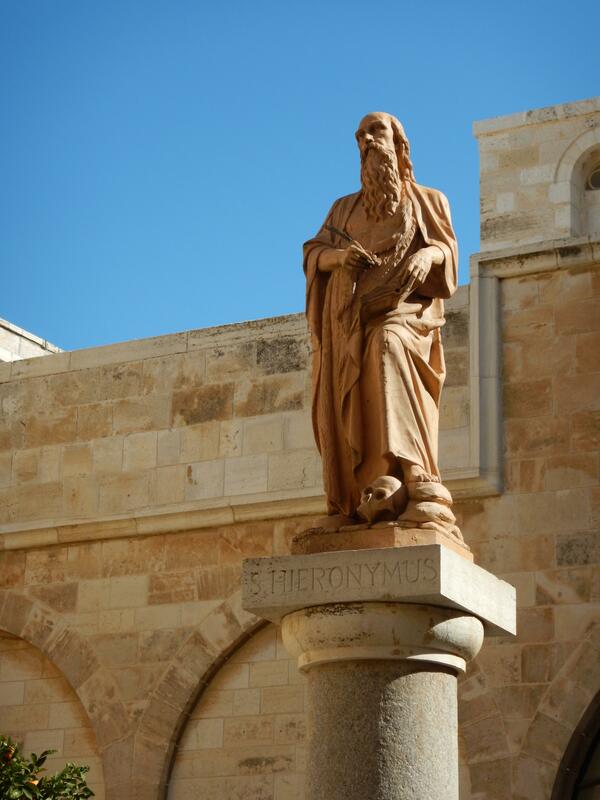 He would have also entered the Temple Mount from here. 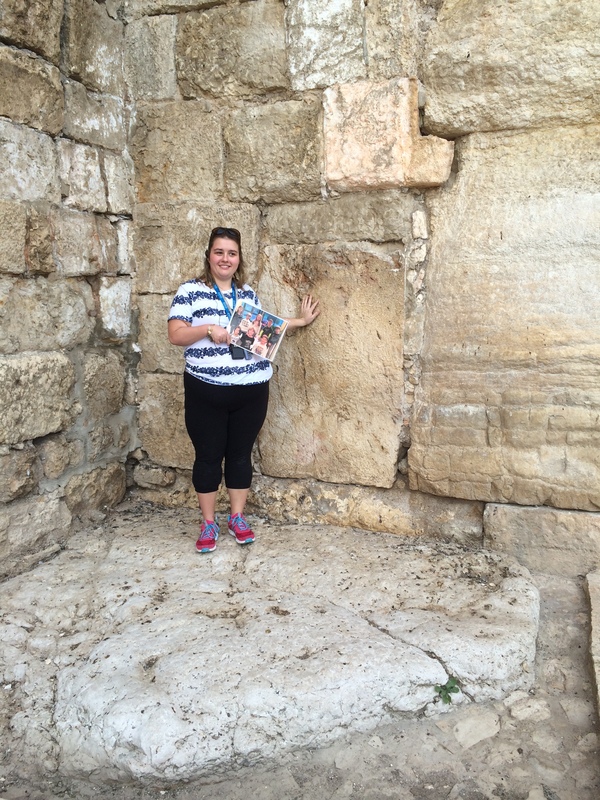 The door was blocked off that He would have entered through but we could touch it and stand on a rock that dated to before Jesus’ time. That means He would have stood here and entered the Temple. How cool. 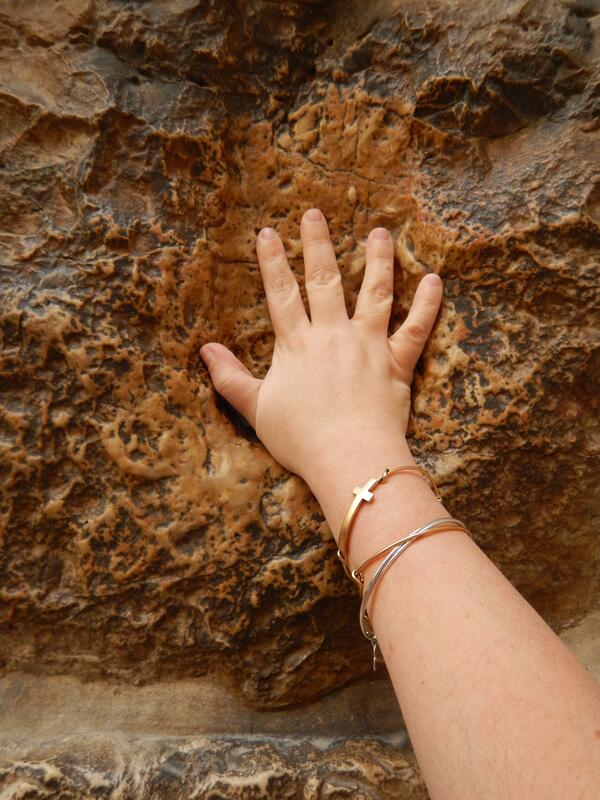 The Western Wall is the most Holy place for Jewish people. 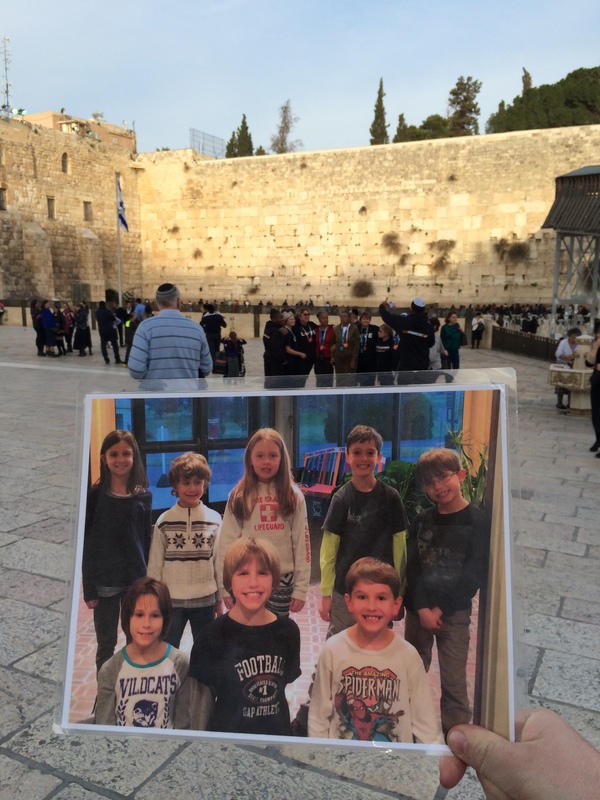 It is the closest that they can get to Temple Mount or the Old Temple that used to be there. They believe that prays left here go directly to God. I went to to the wall not think much. Just in wonder and aw at how big it was and the utmost respect people have for it. 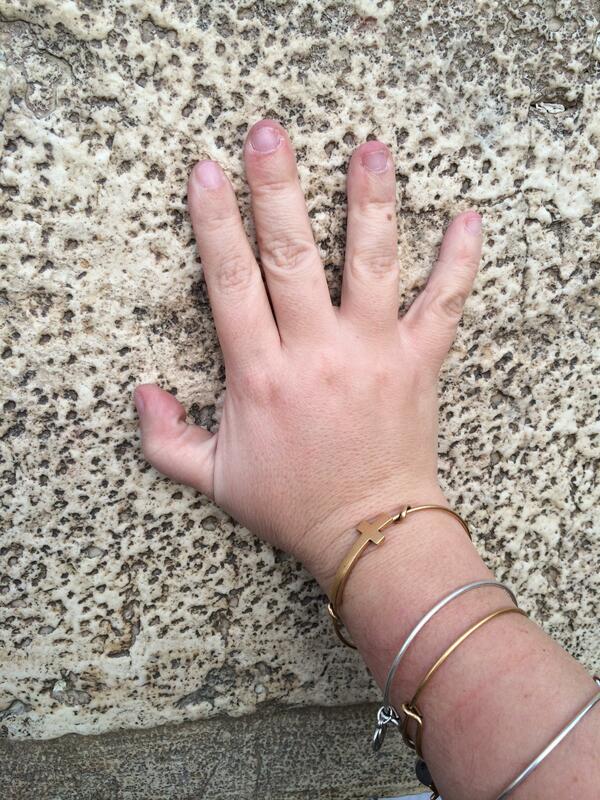 Well I reached out and touched the Western Wall and the first thing that I heard in my head was “Josh”. I was blown away, that is my brother’s name that died when I was 9. It startled me, however I knew it was his way of telling me that he was with God and ok. 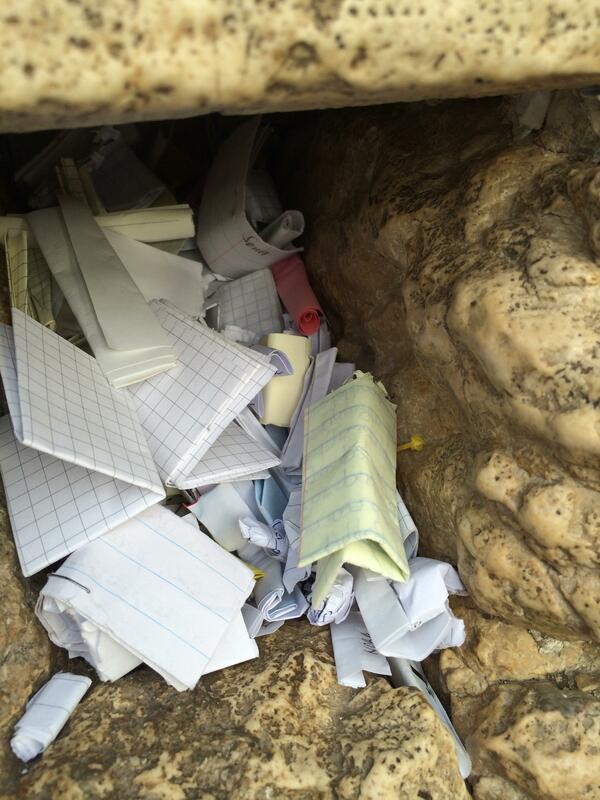 I said my pray and left it at the wall. A friend that I had gotten to know over this week left something important there and I was there to witness it. I was so proud of her and happy that I could be there for her at her moment of need. After that we hugged and cried together. One last touch of the wall before I needed to walk away. The proof that friendships can be made in a week happened that day. I became very emotional after the two great experiences I had. I cried and cried standing there looking back at the wall. One of the other people from my home town walked up to me and asked if I needed a hug and was ok. 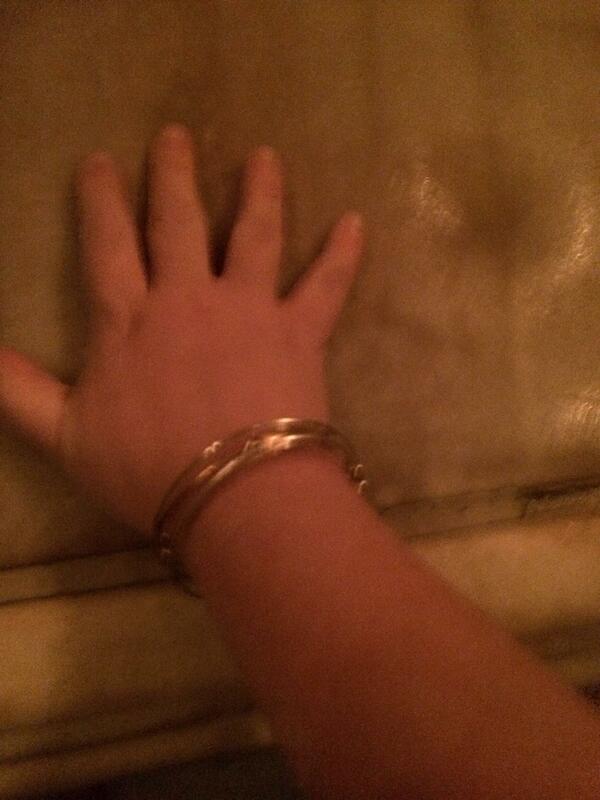 I explained what happened when I touched the wall and she just let me stand there cry well she gave me a hug. These people are true life long friends. We had been through so much together. I was glad this was how our day ended. It was a moment that will stay with me for a long time. However my day wasn’t over. 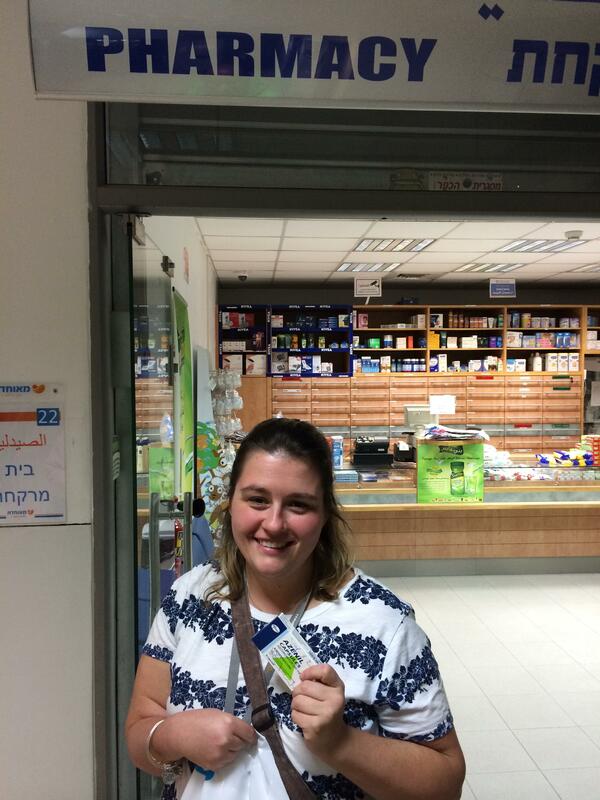 Only I could need to go to Urgent Care in Israel. I had been fighting sore ears since the day after I got there. I was diagnosed with a double ear infection. Yup that’s right, both ears infected and one was really bad. That is how I ended my day, buying medicine at the pharmacy. January 26, today had many stops involved. We were headed for another place that I knew a lot about. We started at the Upper Room. 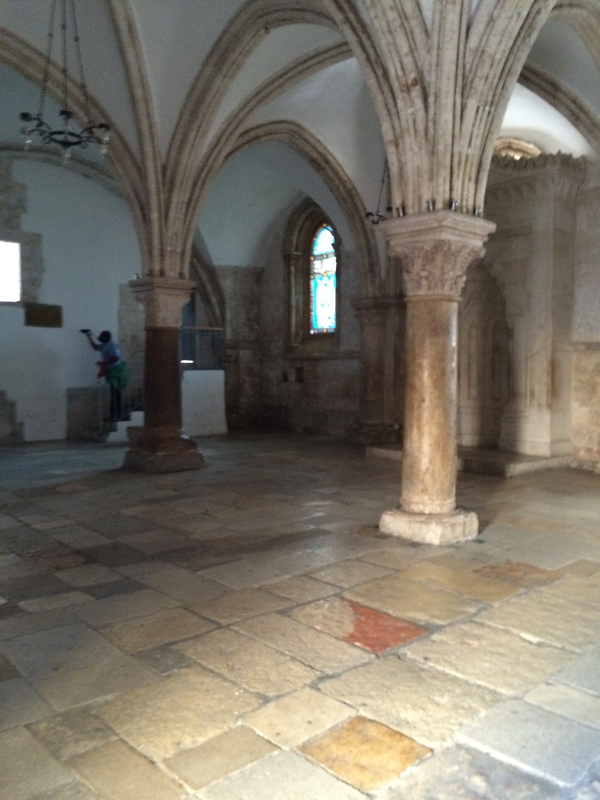 This is where Jesus celebrated Passover and that would become the Last Supper. Once again a lot of walking to get there. It was nothing like I expected, I think that was because it had been turned into a Church at one point and a Mosque at another. So it no longer looked like a room. 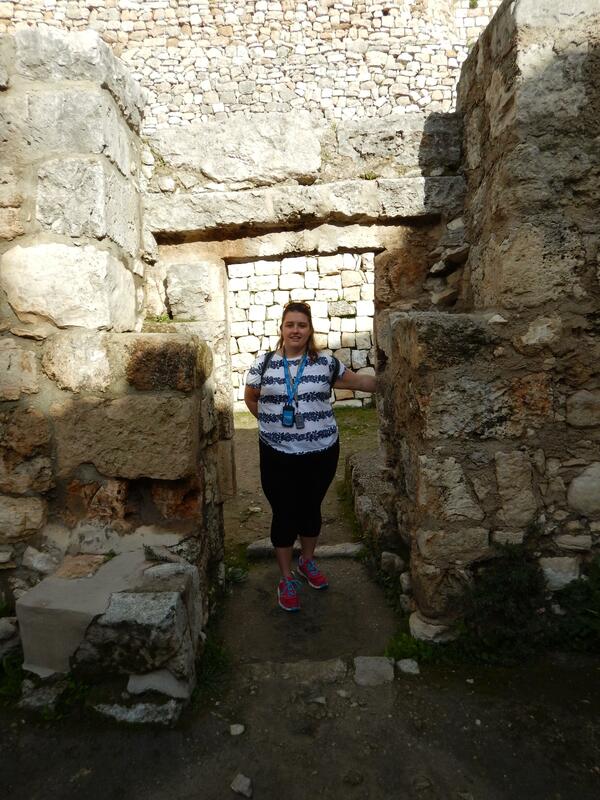 It was cool to be where Jesus spent time with His apostles one last time. 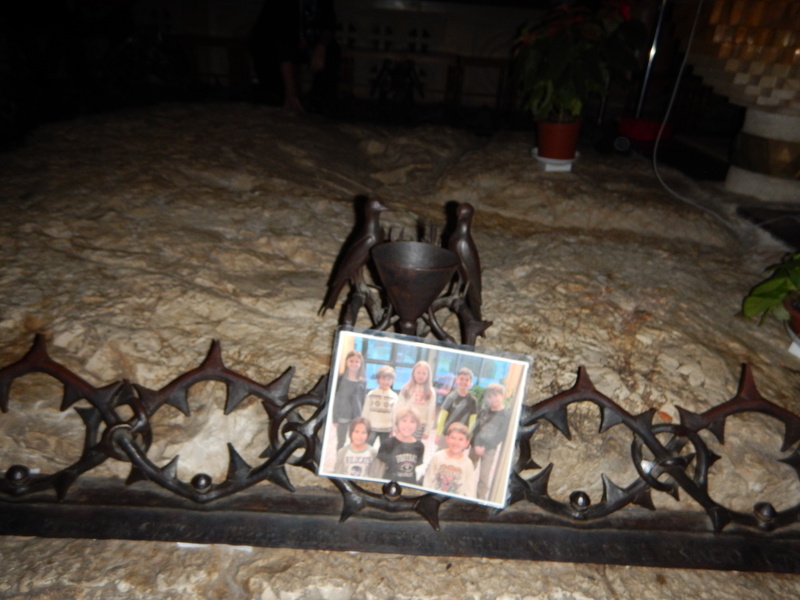 We then headed down the road to the Church that is now built where Caiaphas’ house was. 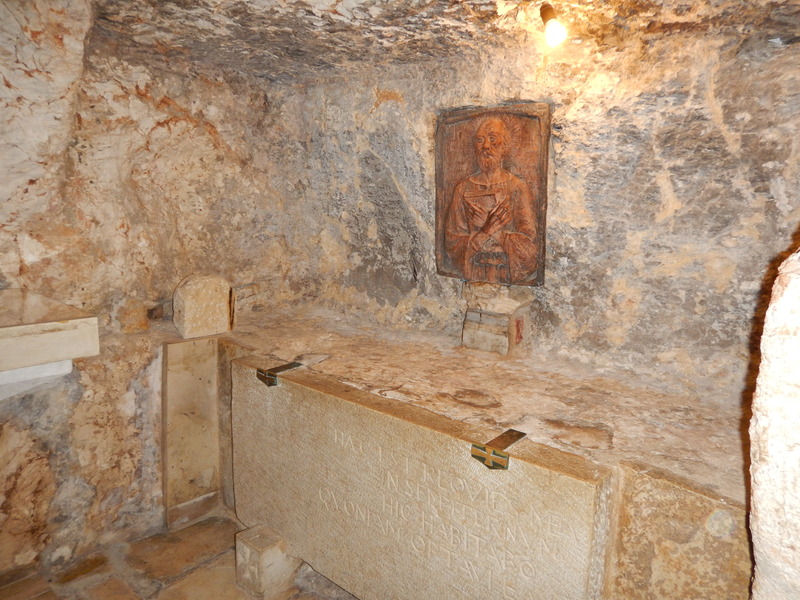 This is where Jesus was jailed over night before He was killed. I may say that I took the most amazing picture of the ceiling by laying on the floor. I never really thought about where or how Jesus was jailed. He was lowered into a pit by rope and then pulled out the same way. 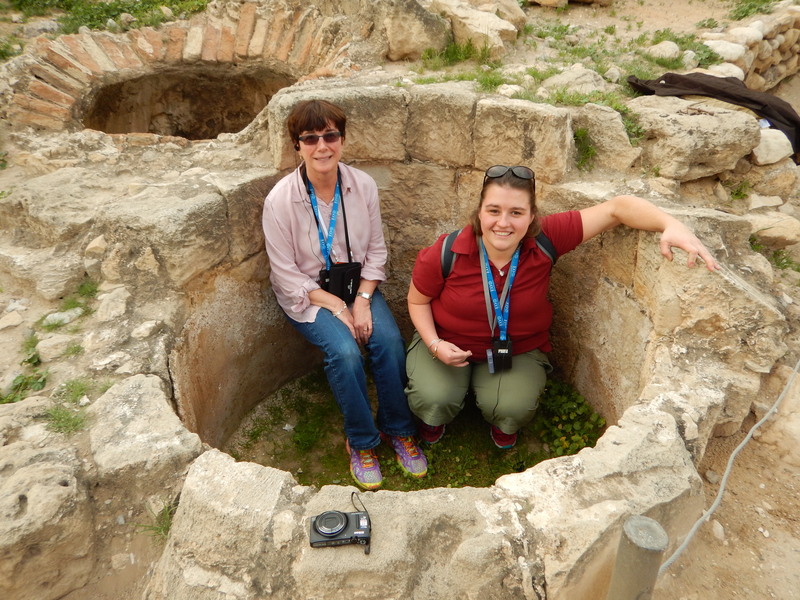 I walked down to the pit and spent my time where Jesus was and felt like that He had been there. 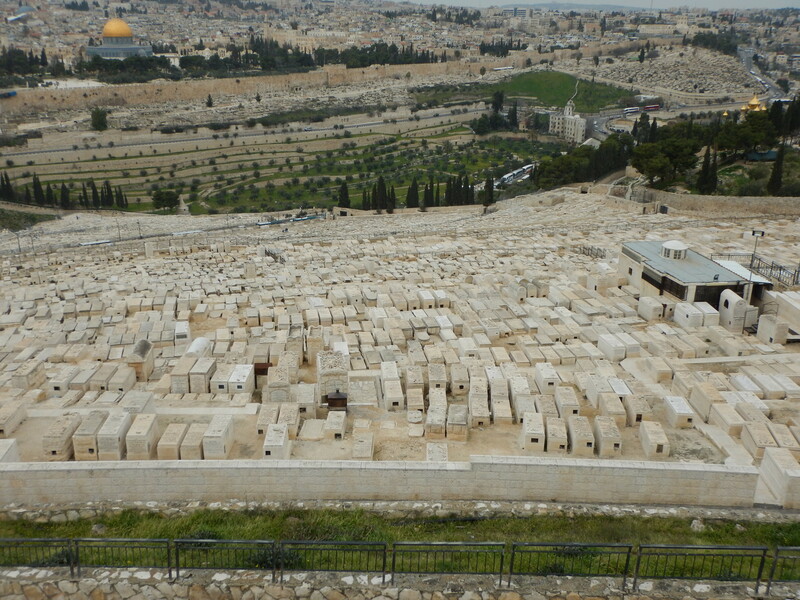 The next stop for the day was the Mount of Olives. 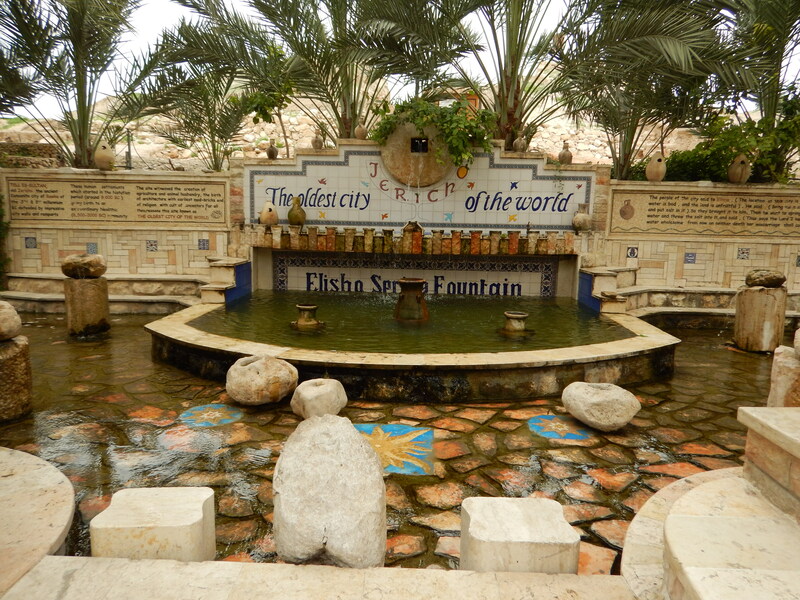 This is where Jesus ascended into Heaven and will come again. 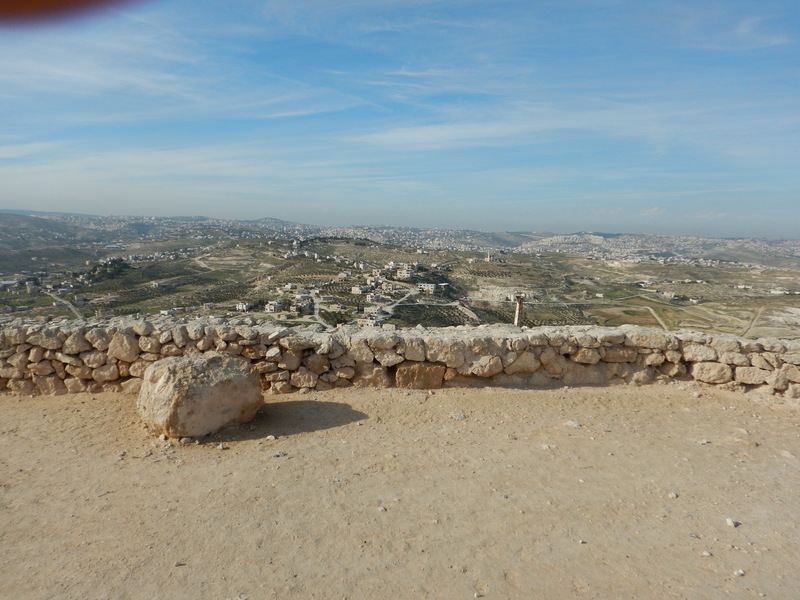 It was very nice up there you could see all of Jerusalem from there. I had something special done here. 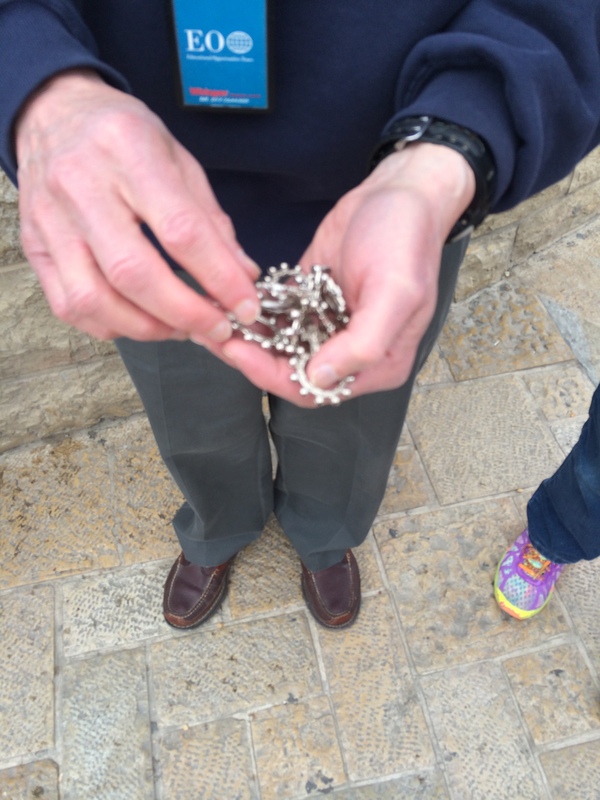 I had been carrying Rosary Rings with me in my backpack all week visiting all the places I visited. They were blessed right there on the top of the Mount. It was so cool. The next two stops would take us back into Palestine. 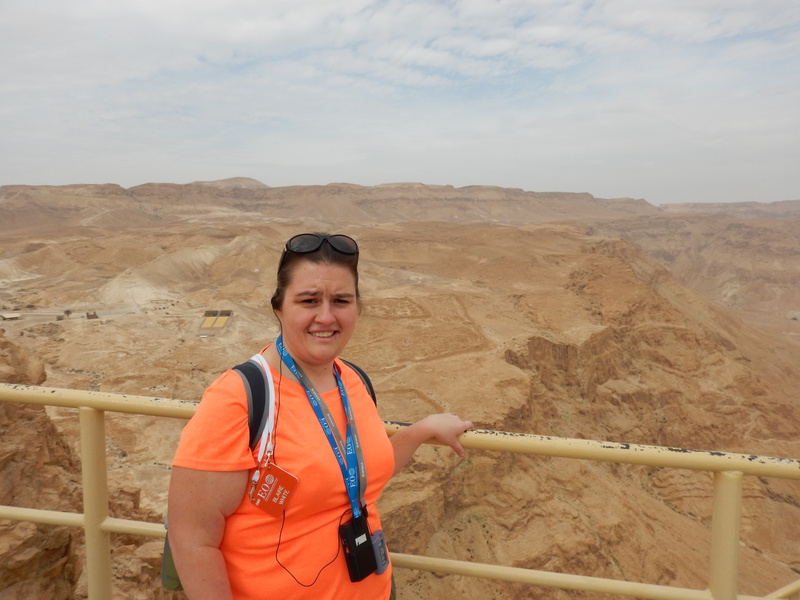 We were headed for Jericho and Qumran. 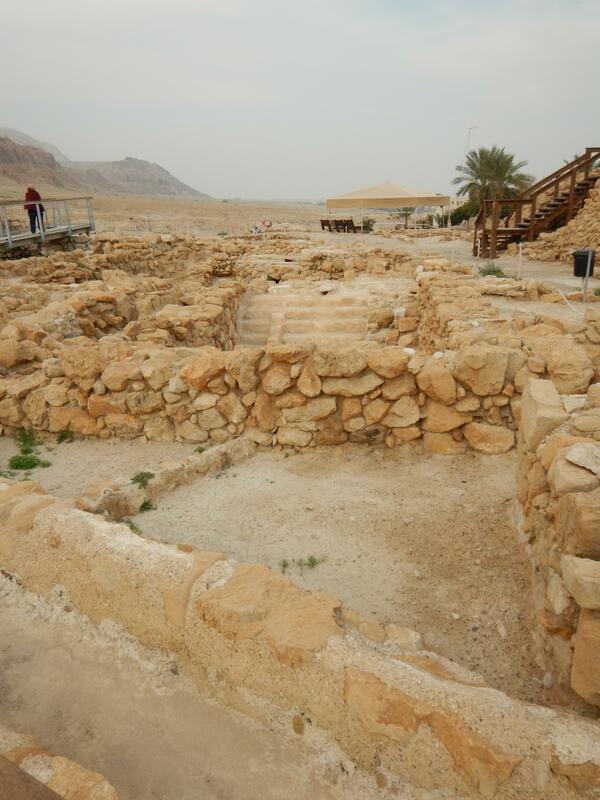 Jericho being the oldest city in the world and Qumran being where the Dead Sea Scrolls were found. They were very neat places to see. 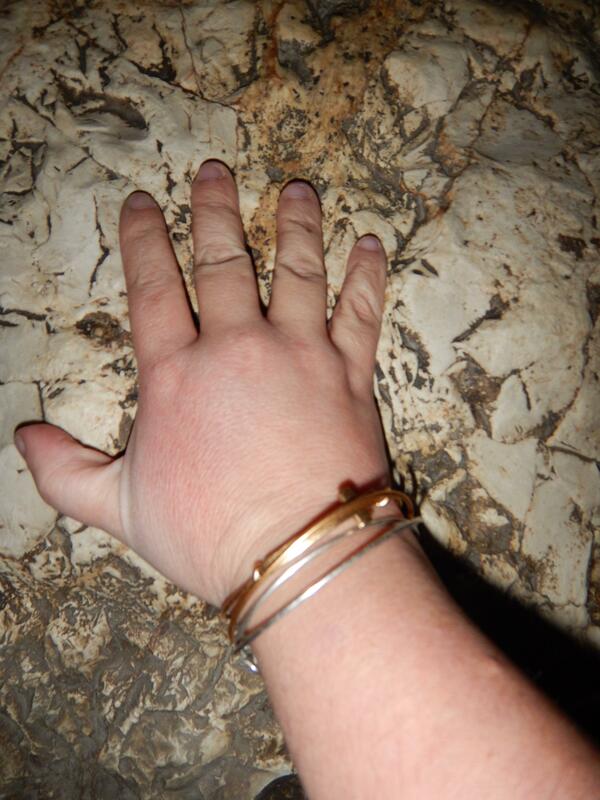 It was cool to see the very old things at Qumran and how people lived way back than. 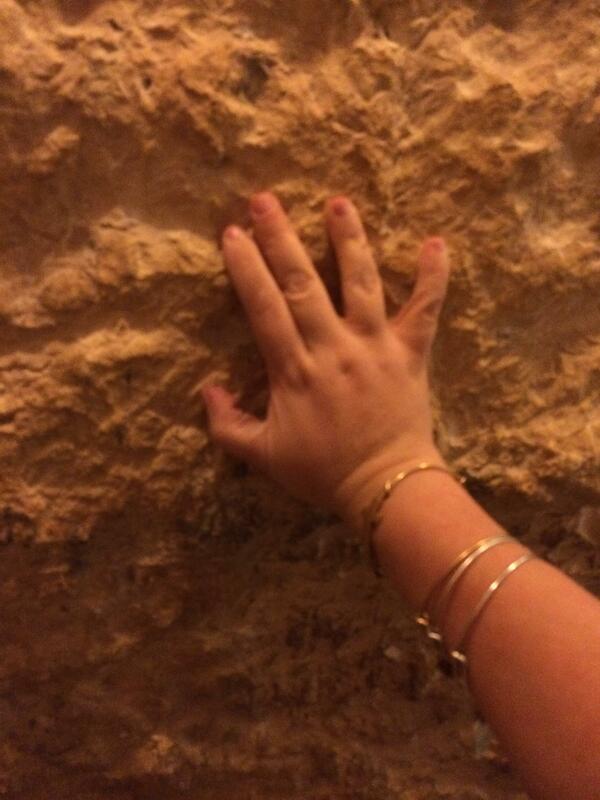 The day ended with us back in Jerusalem. 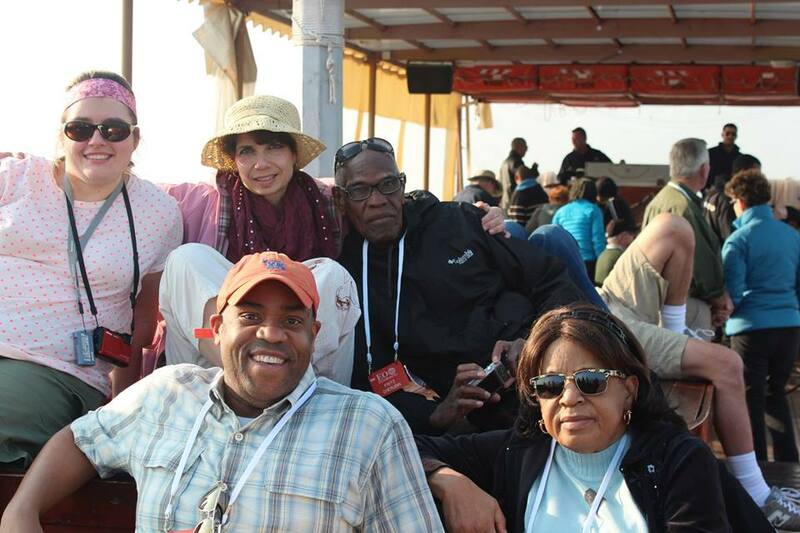 January 27, Today a group of us headed for Masada and the Dead Sea. 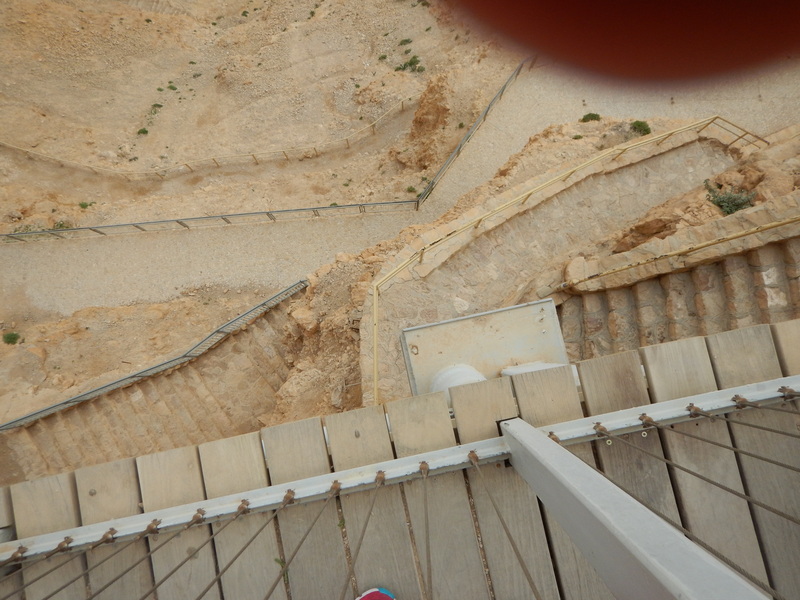 Masada is a palace that was Herod built on top of a massive mountain. It was so high up, as a person afraid of heights I was not too sure about this But it was so worth it. The cable car ride up was a little hard but my nerves kicked in when I had to cross a bridge way up high. I also have a fear of walking over bridges sometimes. Well I made it across and even had my picture taken on the edge. We walked all around up here. We were pretty much stuck the only way down was the cable car. 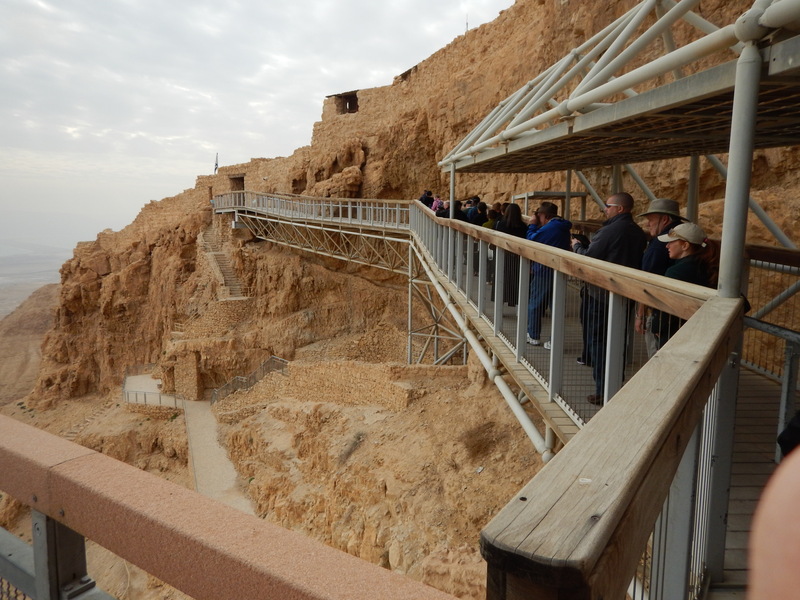 The story behind Masada. 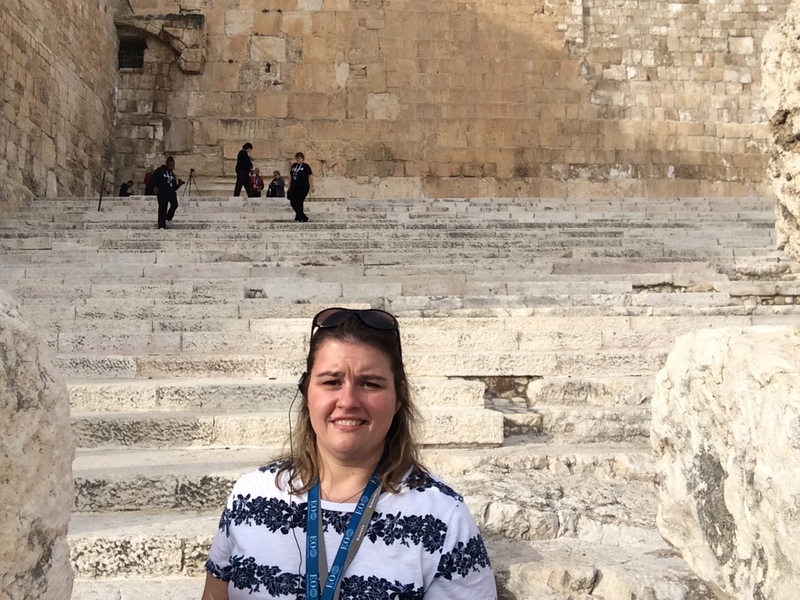 It started out at Herod’s palace, when the Jews were being killed off by the Romans a group of Jewish people hid out here. When they sensed they were going to be captured they decided to kill everyone instead of being captured. Everyone died but 5 people hid in the water tunnels and made it out to tell the story. The Israelis hold this place in high regard, their military is even sworn in here. It was very cool to see this place and how high up it was. 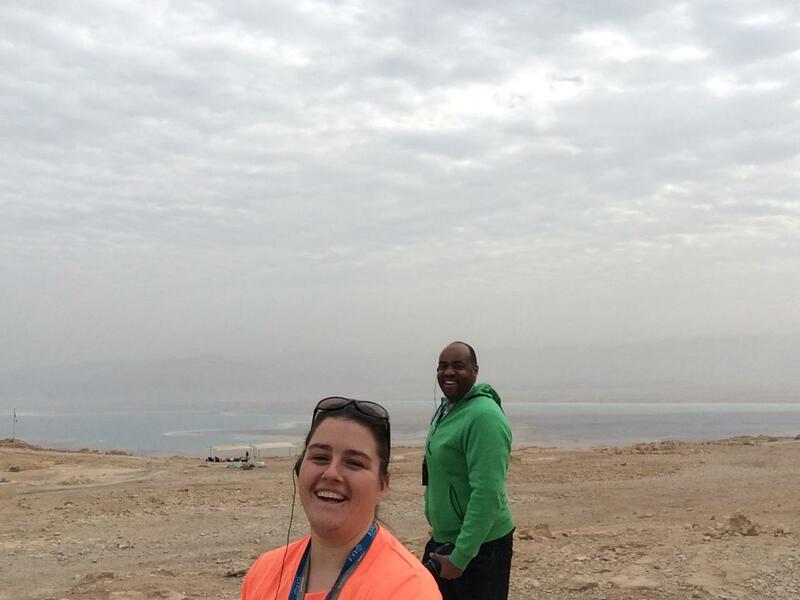 The views to the Dead Sea were amazing. 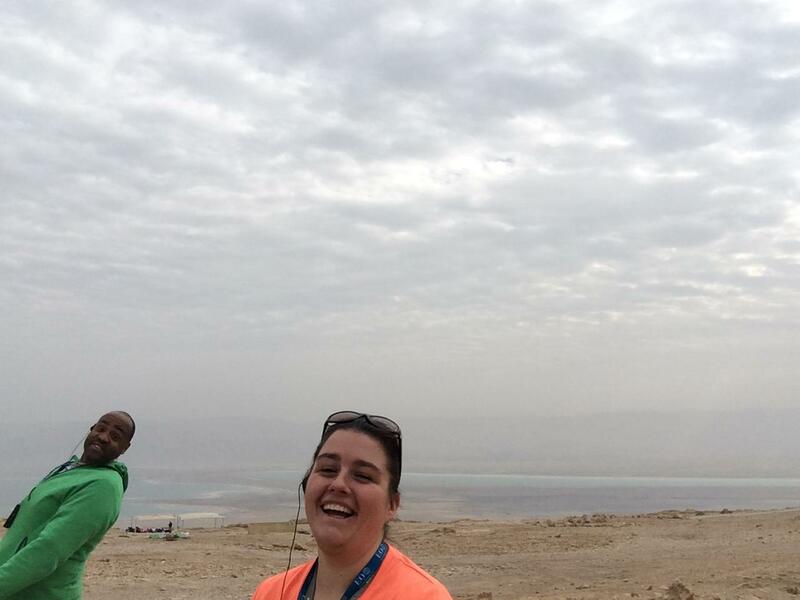 Sidney helped me take a great selfie with the Dead sea in the background. It was a very interesting place to see. The views from up there were just the best. We had some good laughs and enjoyed being together. 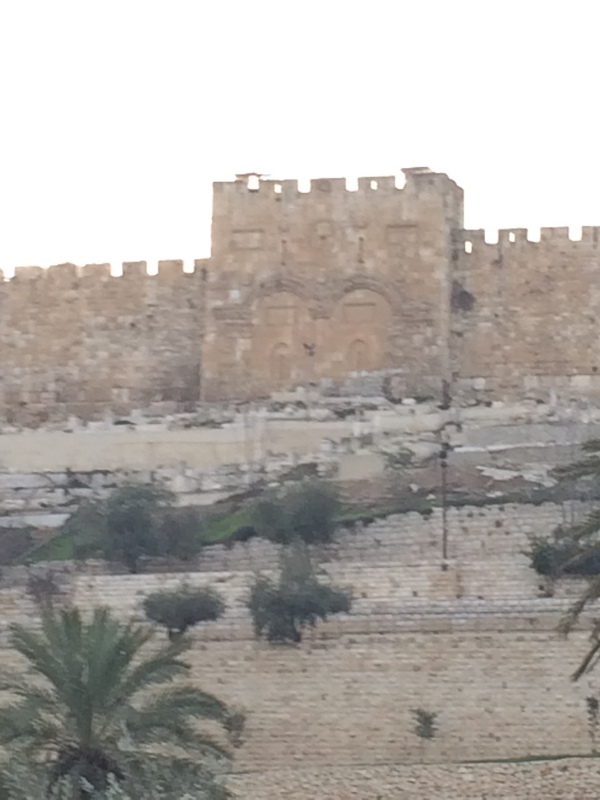 I could see why Herod would want a palace here. 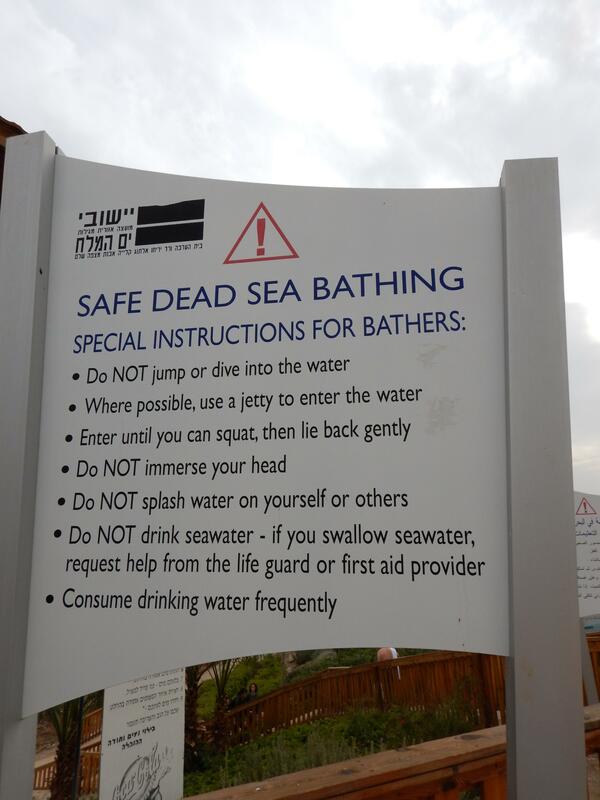 The next part of the day was going to take us to the Dead Sea. This was something I was looking forward to. 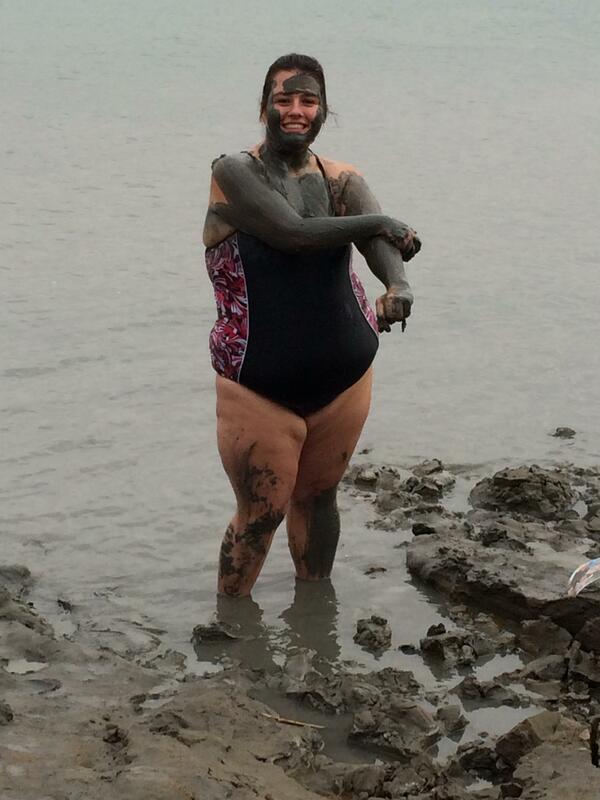 I was going to be floating in the Dead Sea. 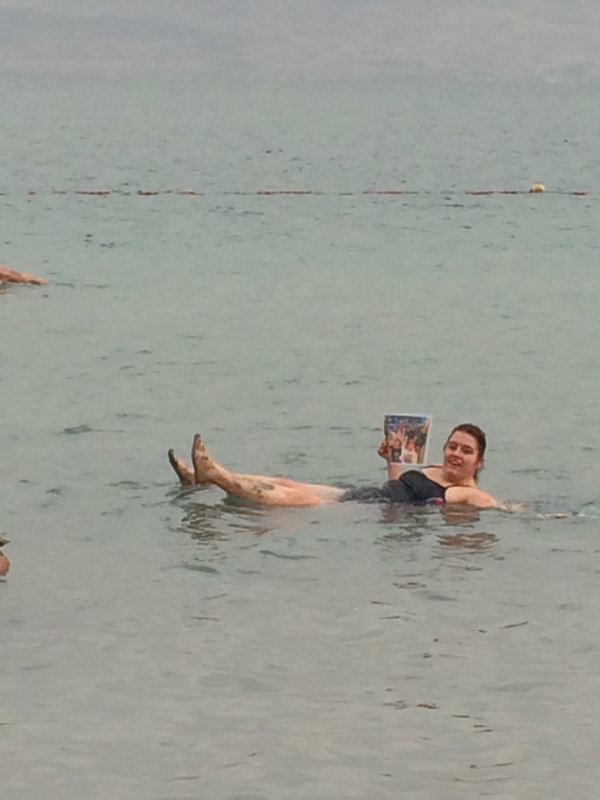 The salt level is so high in the Dead Sea that you float right on top of the water. I was a nice abs workout, keeping your head out of the water. There were many laughs at the sea. From us trying some synchronized floating, to laughing at others as they tried to float or watching each other get covered with mud. 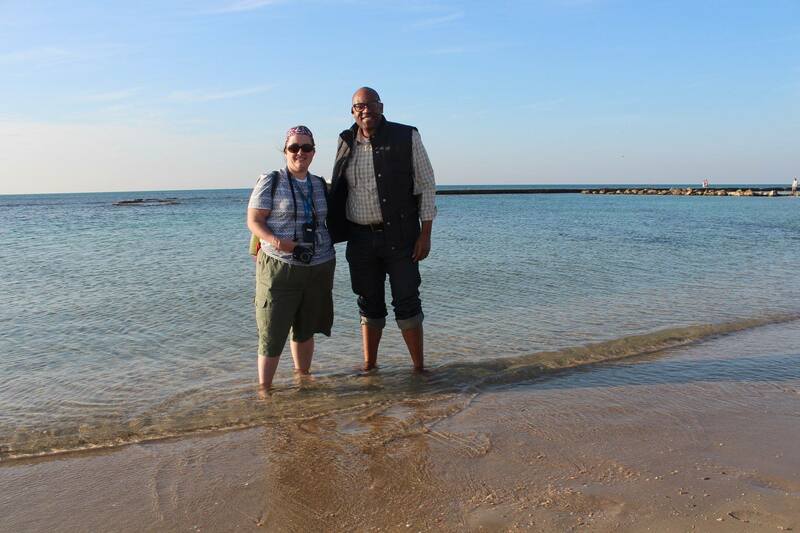 January 28, our last day in Israel. We had the morning off and were headed to a few places in the afternoon. 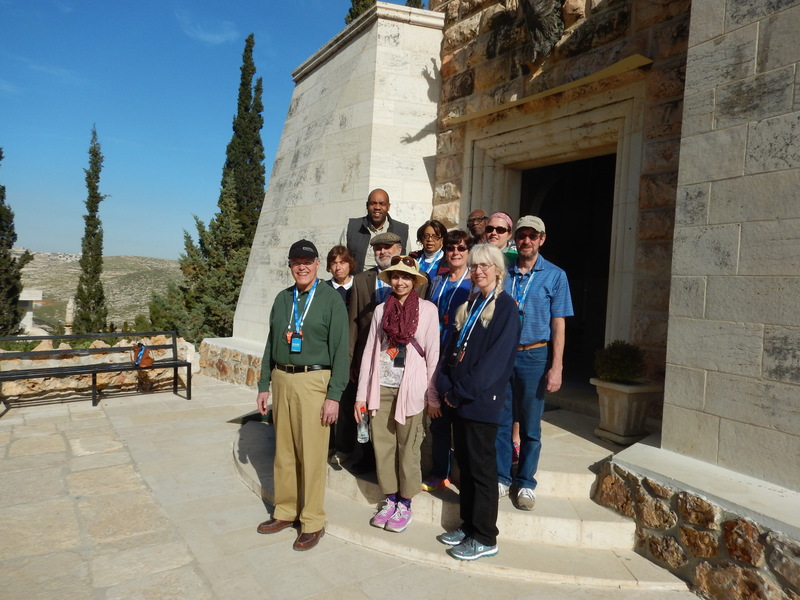 The last three stops for the trip were, where John the Baptist was born, a Holocaust Museum and the Garden tomb. All these places were interesting but nothing that I truly enjoyed. We did have a great last day together. After dinner it was finally time to start heading home. We took the red eye to NYC. I had no problem getting through security this time. They were probably ready to get rid of me. Would you blame them. 13 Hour plane ride to NYC was long but thanks to being able to sleep this time, it was a little faster. This post says it all. This was a trip that I will never forget. It has left me with memories that I will have for a life time. I have done something that very few people will ever get to do. 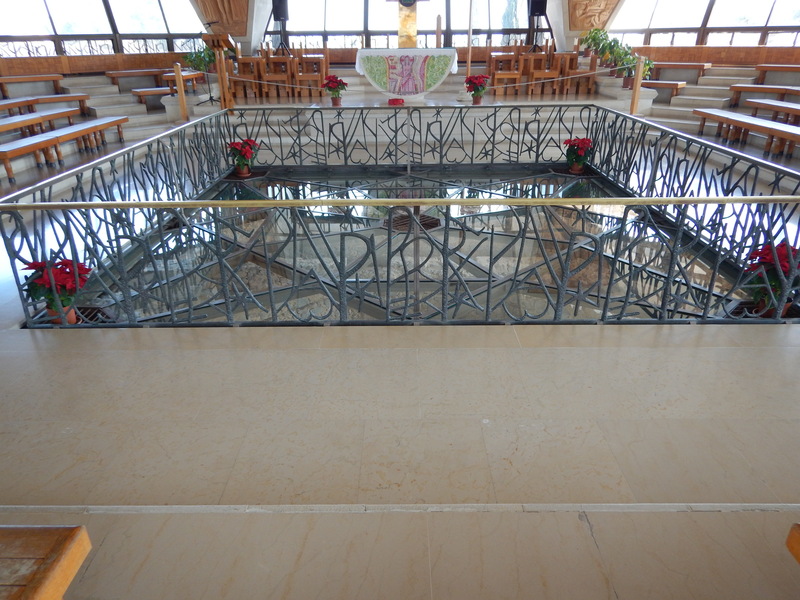 I walked in the footsteps of Jesus. I have a new understanding of my faith. I have a deeper belief in God. I know He does everything for a reason. I have been put on an amazing journey and am living it to the fullest. My hip and me went through a lot during this time. Knowing just 4 short years ago that this all would have caused me so much pain is unbelievable. It wouldn’t have been the same. 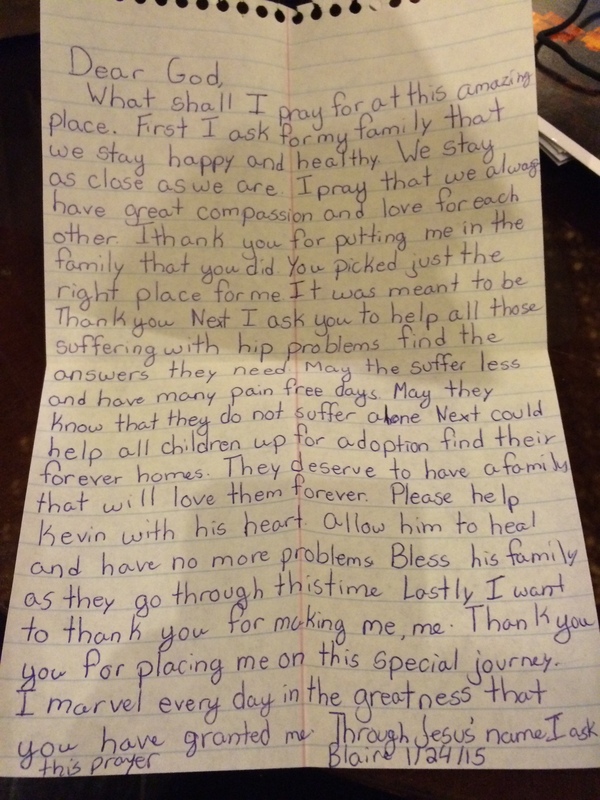 I saw on this trip how much God/Jesus cared for those that were different. He loved them just as much as any other and if not more. He cared for them, just as He cares for them now. As being one of those different people I know God/Jesus cares for me. I have felt His presence often in my life. This trip has forever changed me. My hip journey has forever changed me too. I would like to end with to different quotes from the bible. I have done just that. I have come through every trail that has been set before because of God. He made me who I am. I leave you with this. As I continue to live life, this is how I feel most days.